Photographed by Vicki Powys, summer and autumn 2012-13, using Canon Ixus 1100 HS pocket camera. These photos are copyright to Vicki Powys. 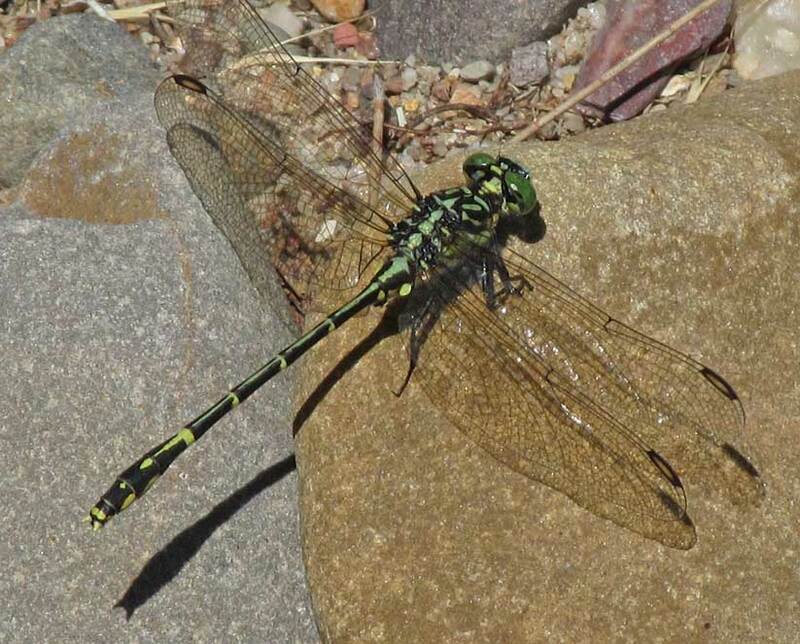 29 species are listed in taxonomic order according to “The complete field guide to Dragonflies of Australia”, Theischinger and Hawking, CSIRO 2010. 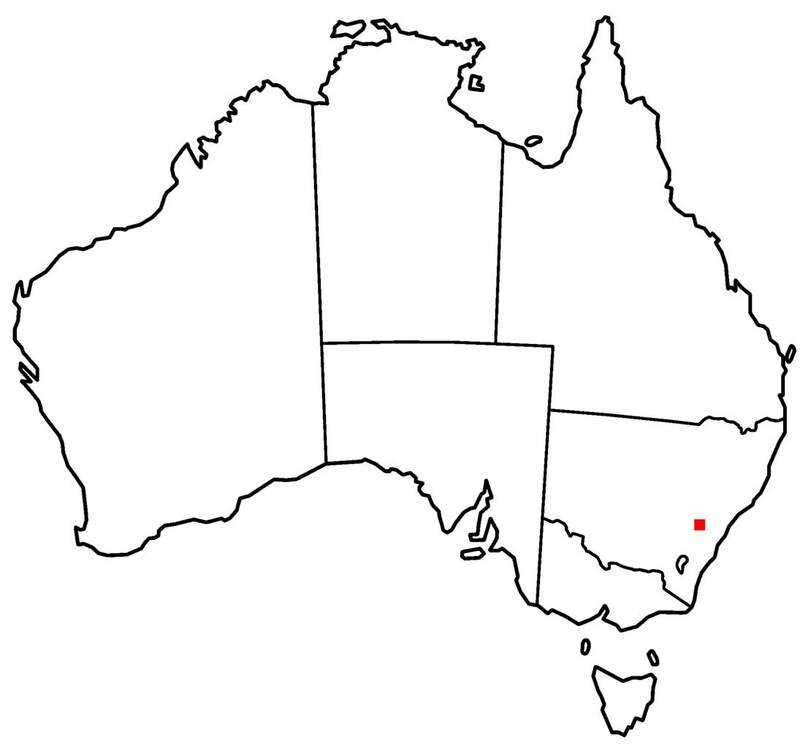 There are 324 different species across all of Australia. 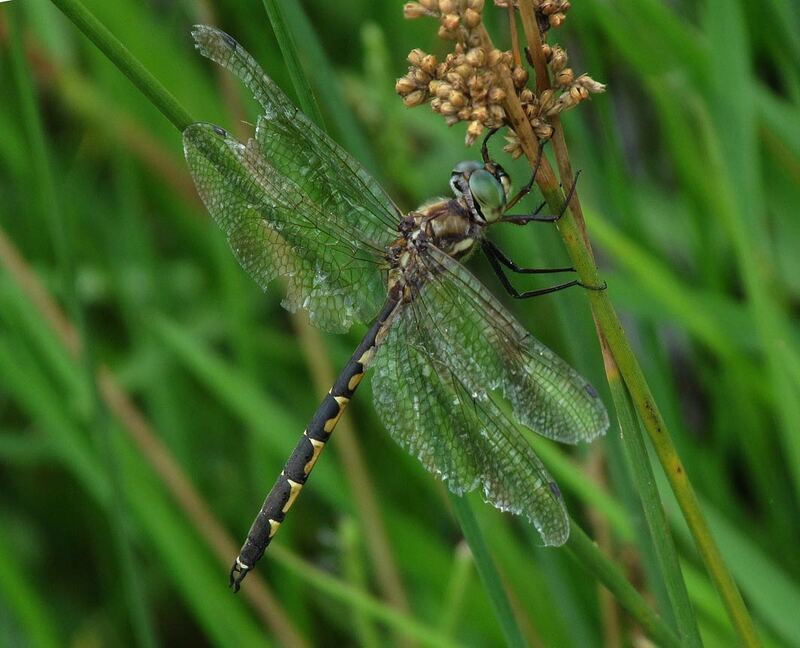 Do let me know if you have found any other dragonfly species for Capertee Valley! Arrowhead Rockmaster Diphlebia nymphoides, male. Common along Coco Creek, often perches on rocks and boulders. Medium size. Arrowhead Rockmaster Diphlebia nymphoides, female. Arrowhead Rockmaster Diphlebia nymphoides, pair mating in the wheel position. Bronze Needle Synlestes weyersii, female. Uncommon, occasionally seen along Coco Creek. Medium size. Cup Ringtail Austrolestes psyche, mature blue male. 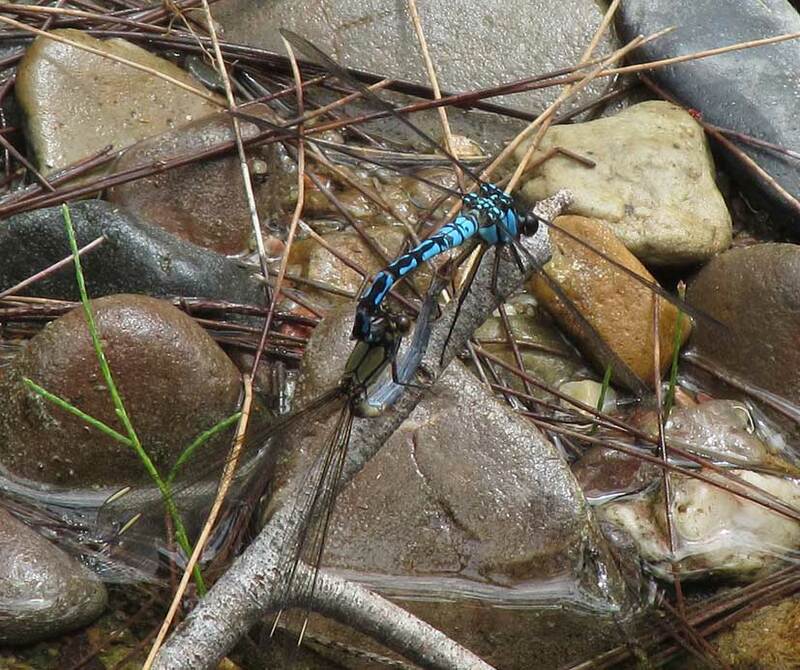 Rare in Capertee Valley, this one was photographed at a bush dam at Sunny Corner NSW. Small-medium size. Cup Ringtail Austrolestes psyche, young male. Cup Ringtail Austrolestes psyche, young female. 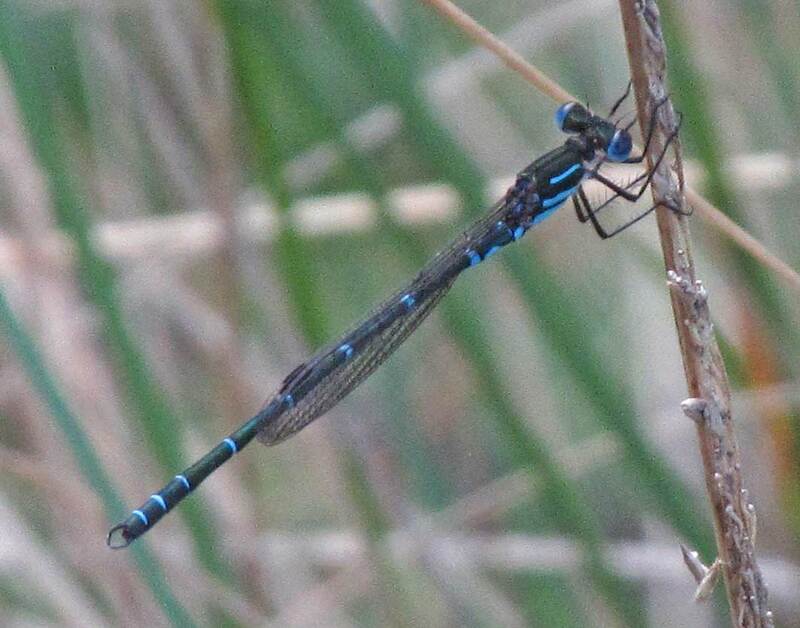 Wandering Ringtail Austrolestes leda, mature blue male. Uncommon, seen at rivers, creeks and dams. Note the single ring at the end of the tail, hence ‘ringtail’. Medium size. 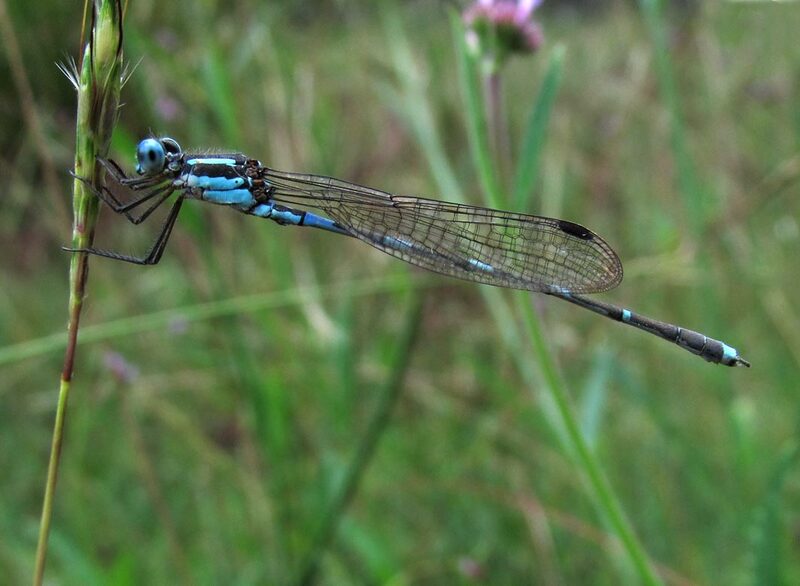 Wandering Ringtail Austrolestes leda, this mature blue male had a bronze sheen. 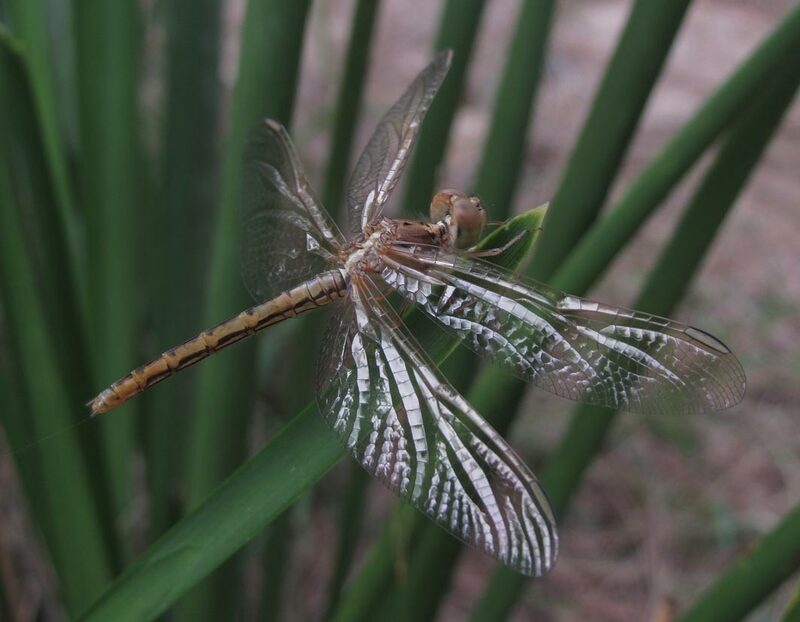 Wandering Ringtail Austrolestes leda, immature brown male. 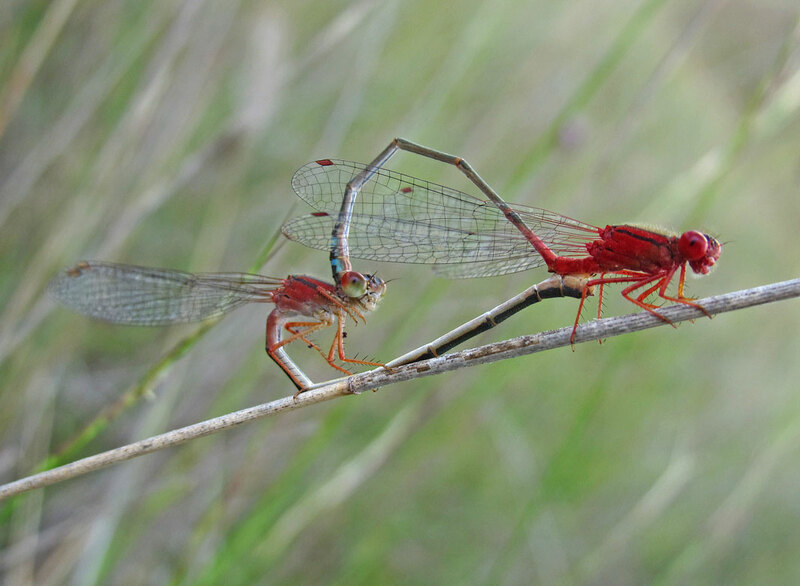 Wandering Ringtail Austrolestes leda, male and female in tandem. Common Flatwing Austroargiolestes icteromelas, male. Common in vegetation along Coco Creek. Medium size. 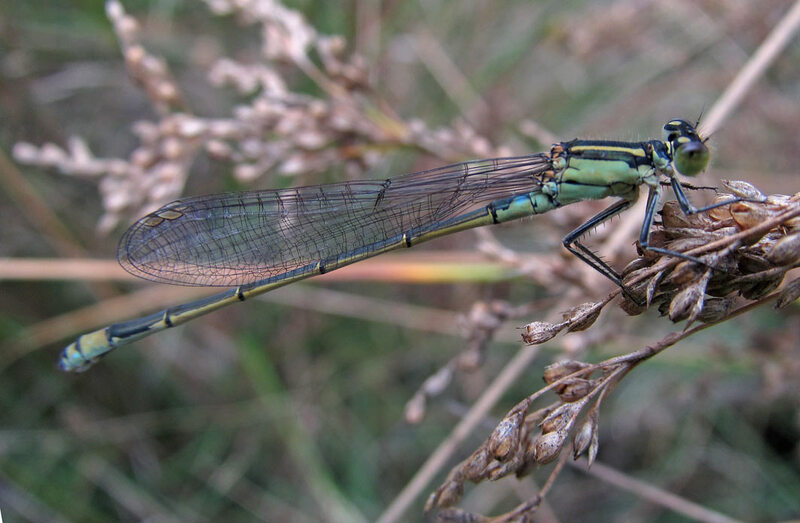 Common Flatwing Austroargiolestes icteromelas, female, showing a blue-ish colour variation. Common Flatwing Austroargiolestes icteromelas, female, close-up showing diagnostic pattern on thorax. Orange Threadtail Nososticta solida, male. 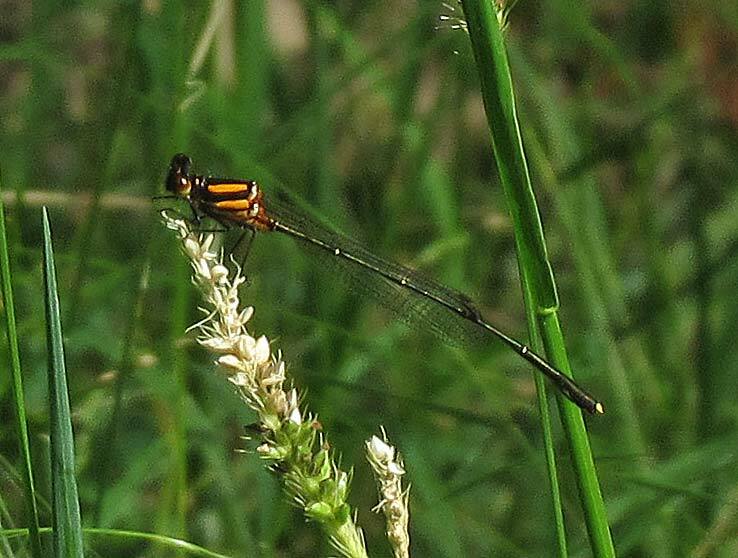 This was the only one I saw, in grassy vegetation along the Capertee River in March. Small size. Powdered Wiretail Rhadinosticta simplex, male. 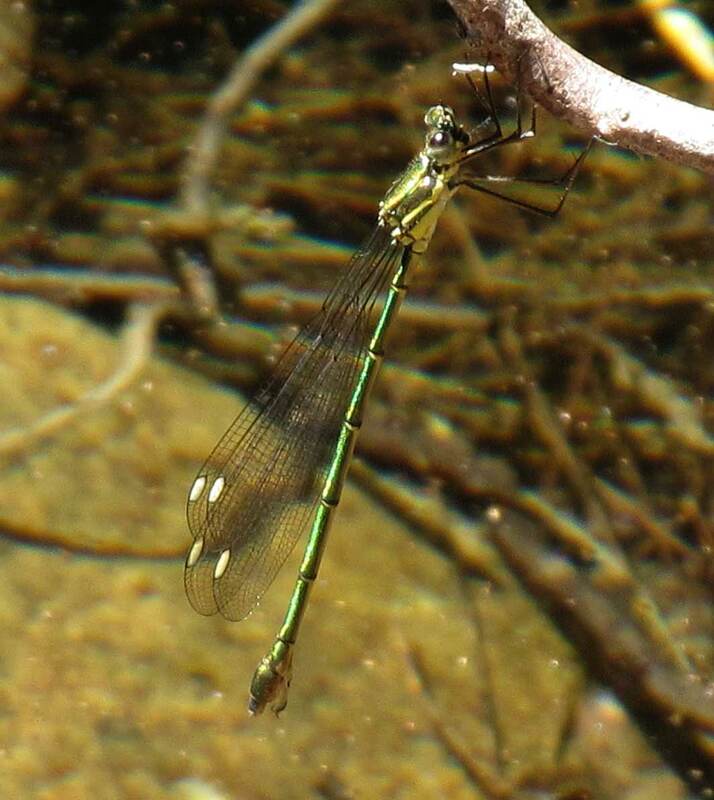 Uncommon, these ones were seen at the Capertee River below Glen Davis. This species seems to float rather than fly. Small size. Powdered Wiretail Rhadinosticta simplex, female. Gold-fronted Riverdamsel Pseudagrion aureofrons, male. Uncommon, a small population at the Capertee River near Glen Alice were low-flying back and forth over a deep, flowing pool and occasionally landing on long reeds or twigs close to the water. Small size. 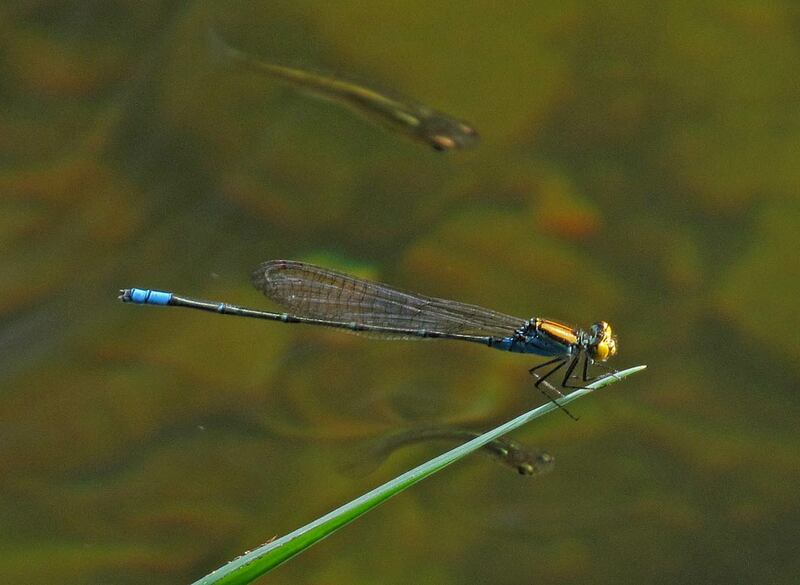 Gold-fronted Riverdamsel Pseudagrion aureofrons, male, with small fish, Capertee River. 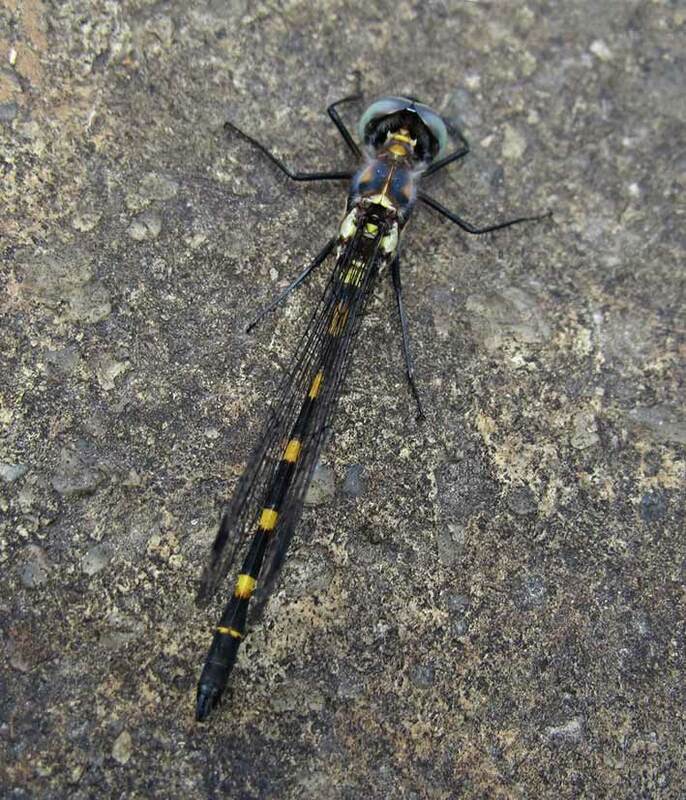 Flame-headed Riverdamsel Pseudagrion ignifer, top view, possibly a male. 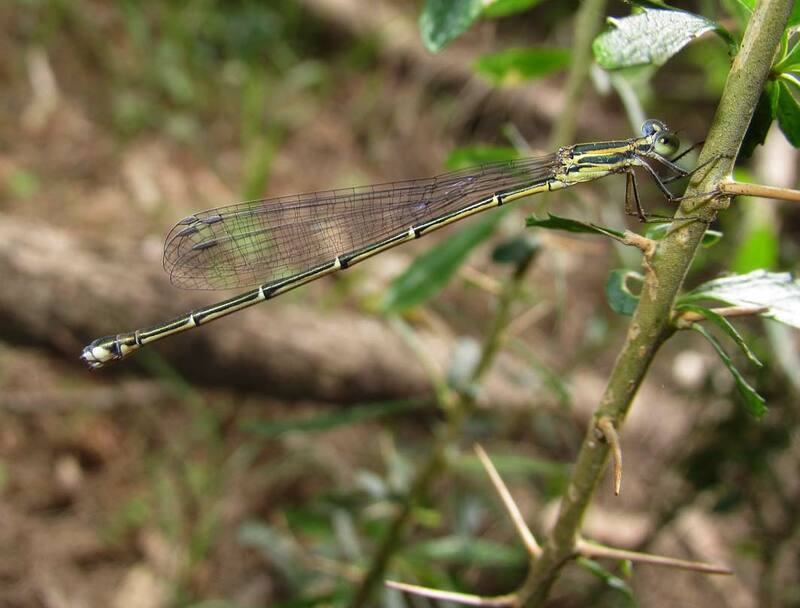 Uncommon, only 1 or 2 seen, near the population of Gold-fronted Riverdamsels on the Capertee River near Glen Alice. Small size. 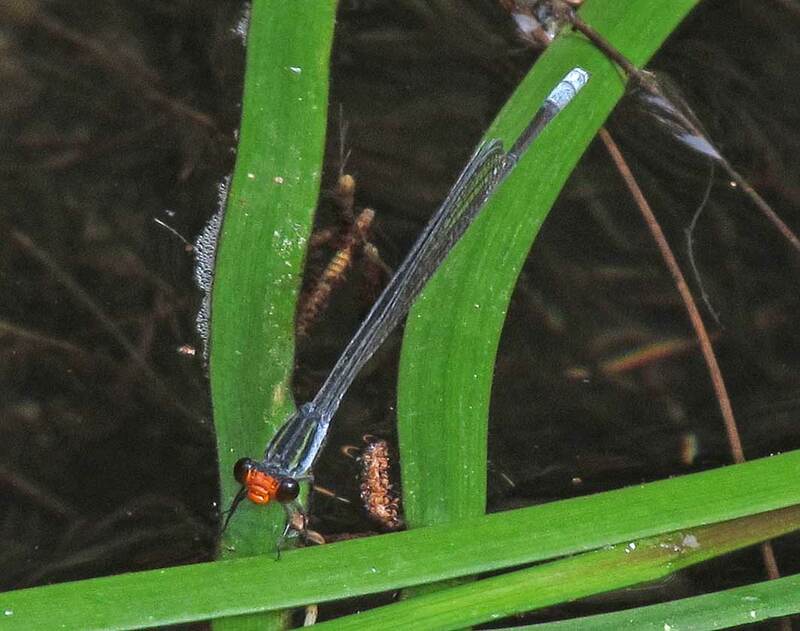 Flame-headed Riverdamsel Pseudagrion ignifer, side view. 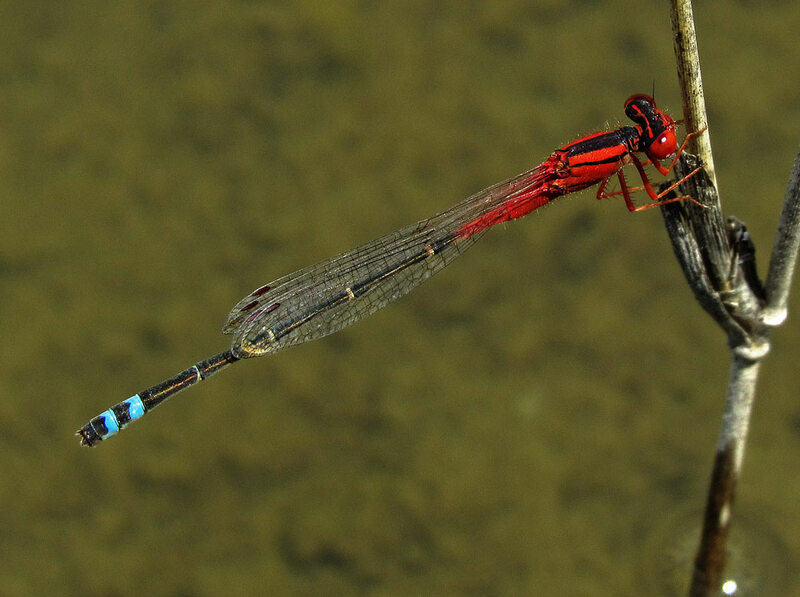 Red & Blue Damsel Xanthagrion erythroneurum, male. 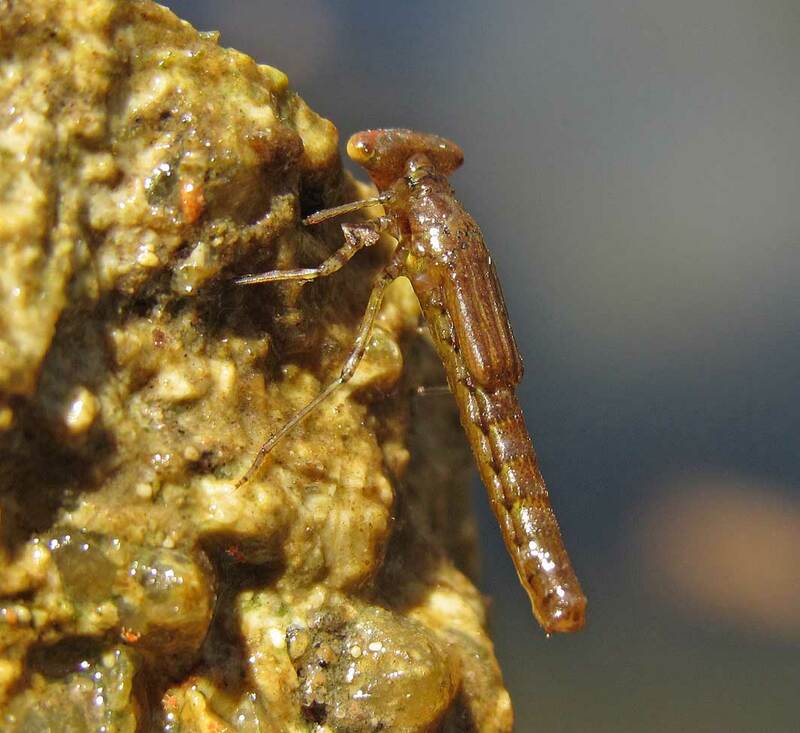 Common on some farm dams where they perch close to the water surface on twigs and floating leaves. Small size. 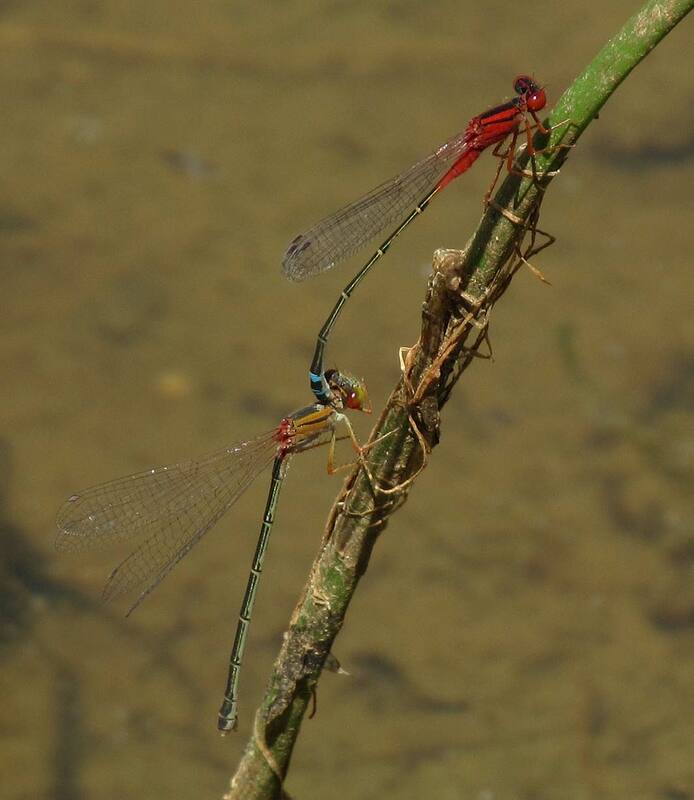 Red & Blue Damsel Xanthagrion erythroneurum, male and female in tandem. Note the old larvae cases on reed stem. Colouring of females was variable but they were always a lighter colour than the bright red males. 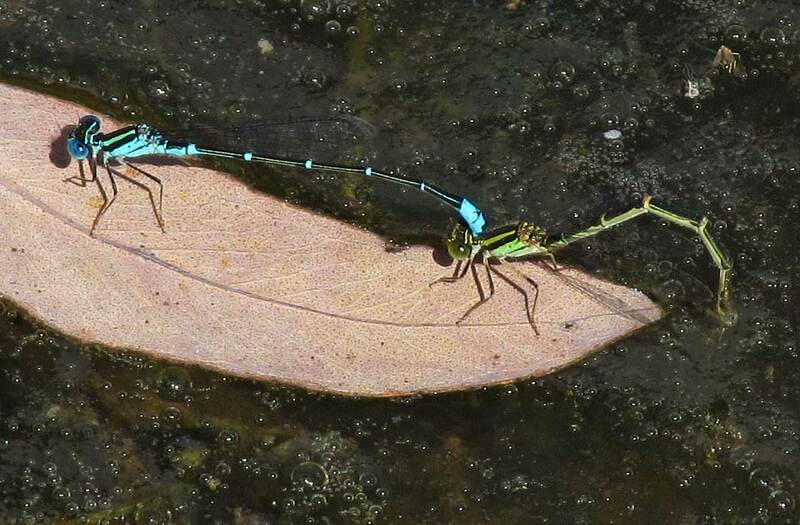 Red & Blue Damsel Xanthagrion erythroneurum, male and female mating in the wheel position. Eastern Billabongfly Austroagrion watsoni, male. 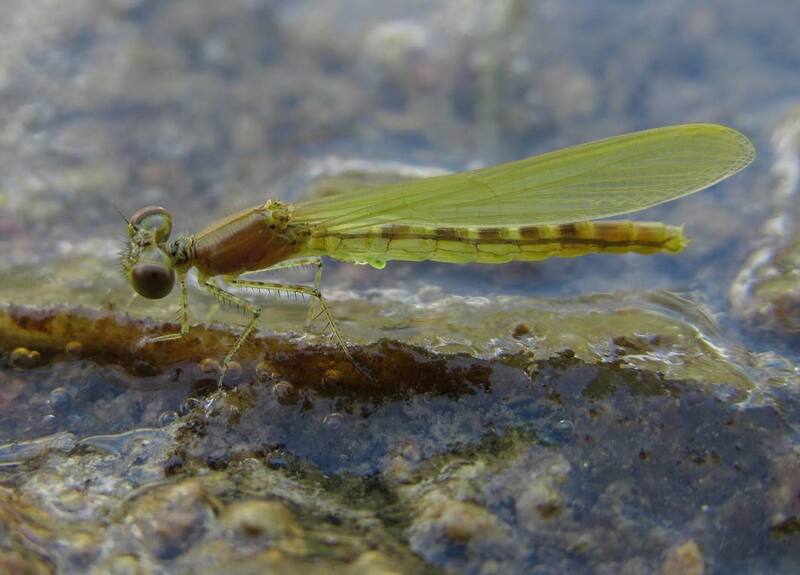 Common on some dams and occasionally seen at the Capertee River, very small in size. 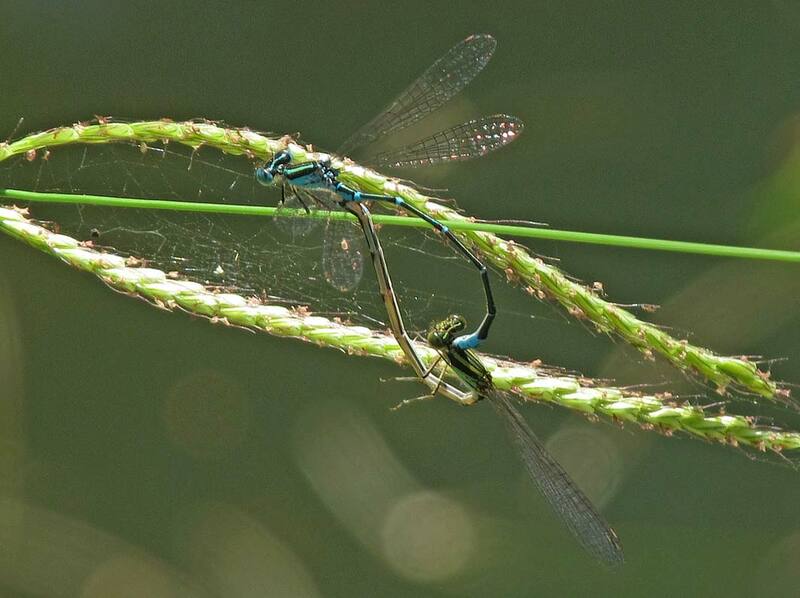 Eastern Billabongfly Austroagrion watsoni, male and female mating in the wheel position. 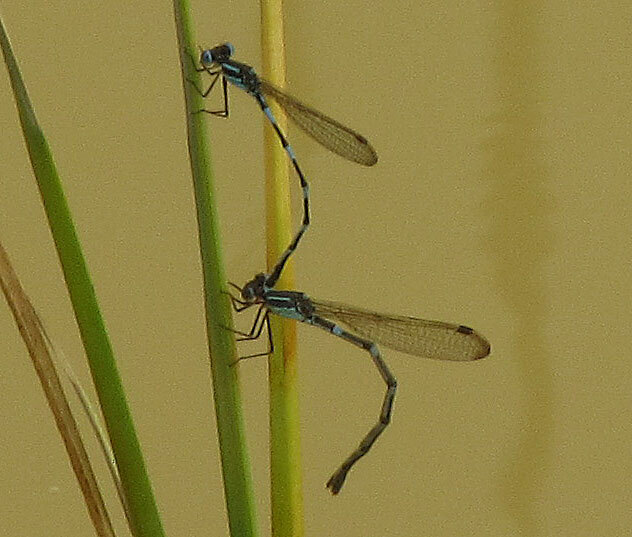 Eastern Billabongfly Austroagrion watsoni, male and female in tandem, female is laying eggs in aquatic vegetation. 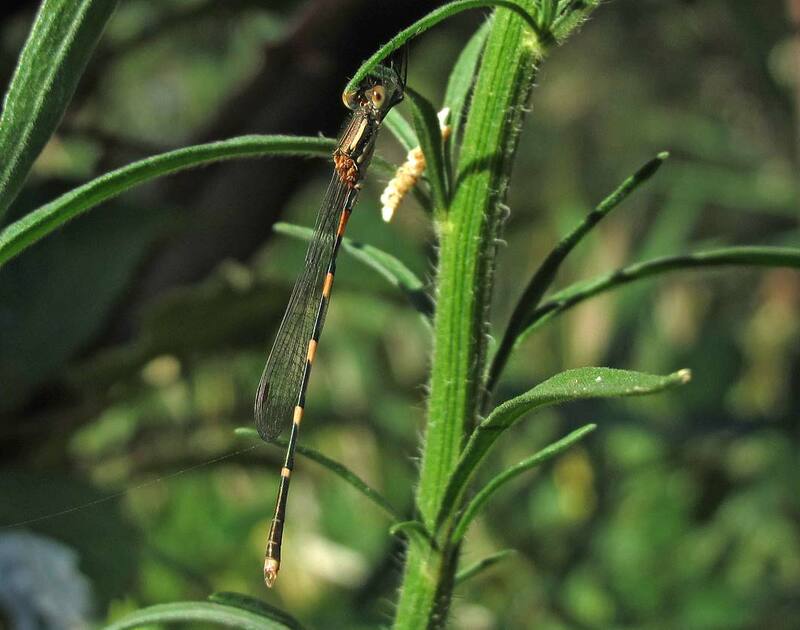 Damselfly larvae about to hatch, possibly Eastern Billabongfly as there were many in the vicinity. 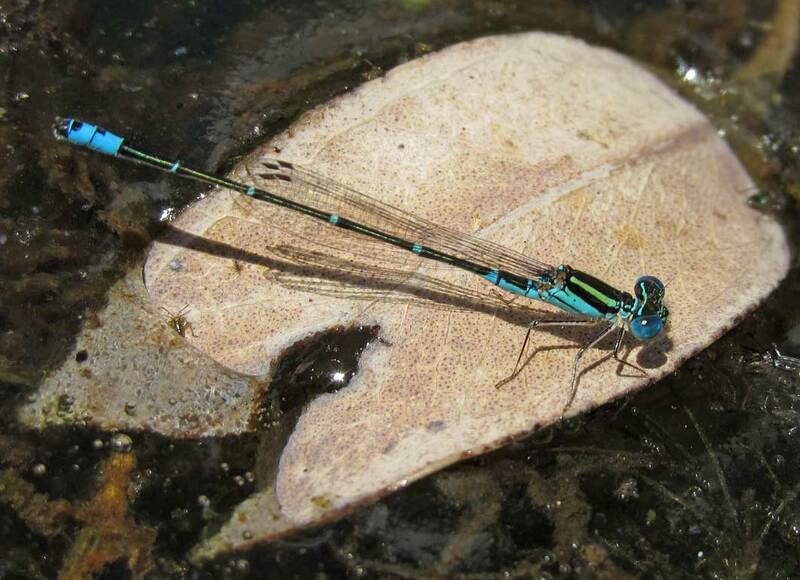 Newly-hatched damselfly, possibly Eastern Billabongfly, or alternately Red & Blue Damsel, both were common in the area. 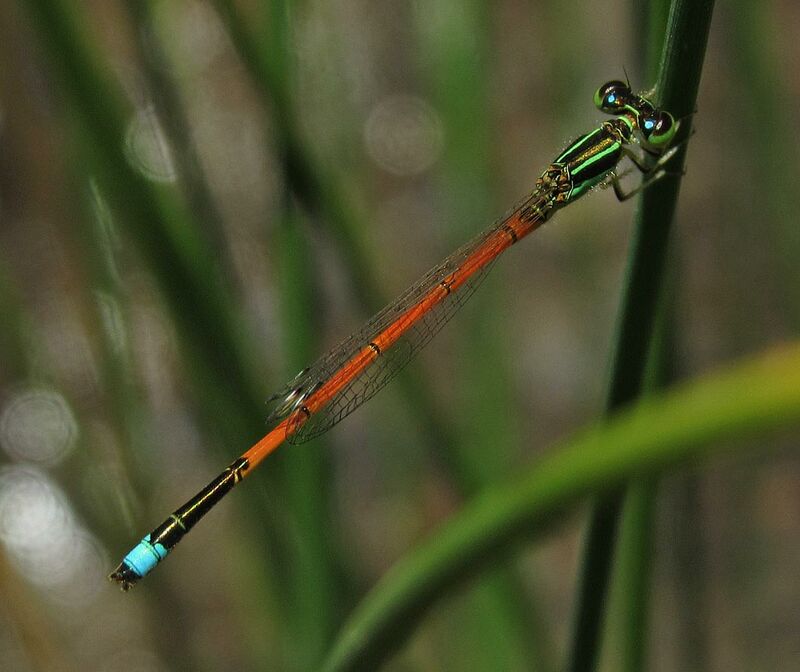 Aurora Bluetail Ischnura aurora, male. 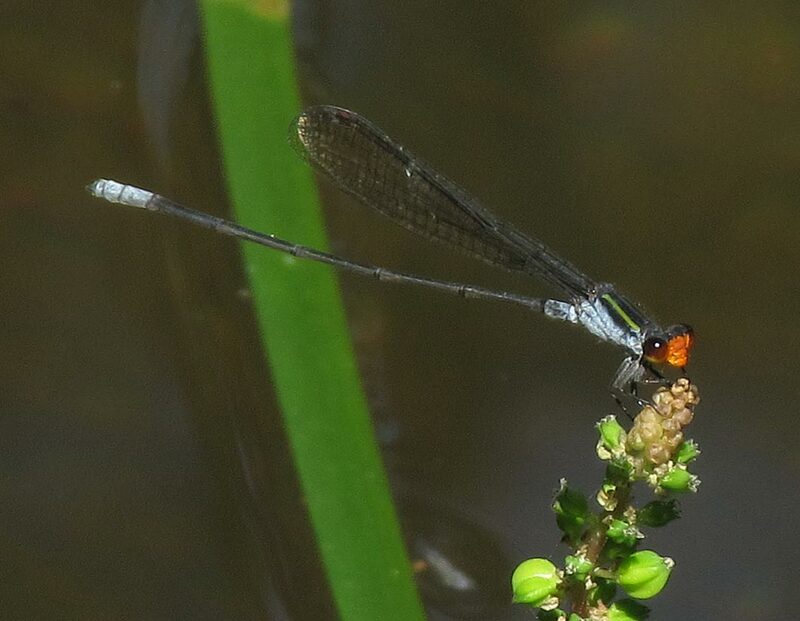 Uncommon, small populations seen in shallow bush dams, in reeds. 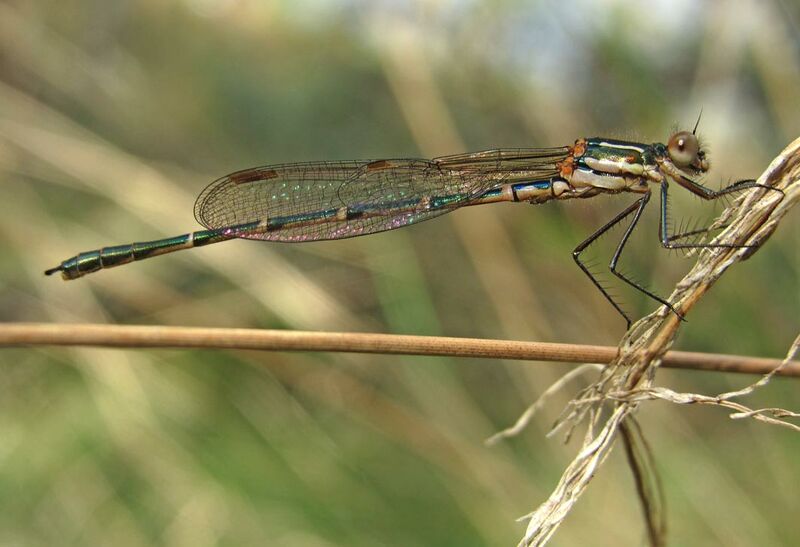 This beautiful species is quite tiny and easily overlooked. 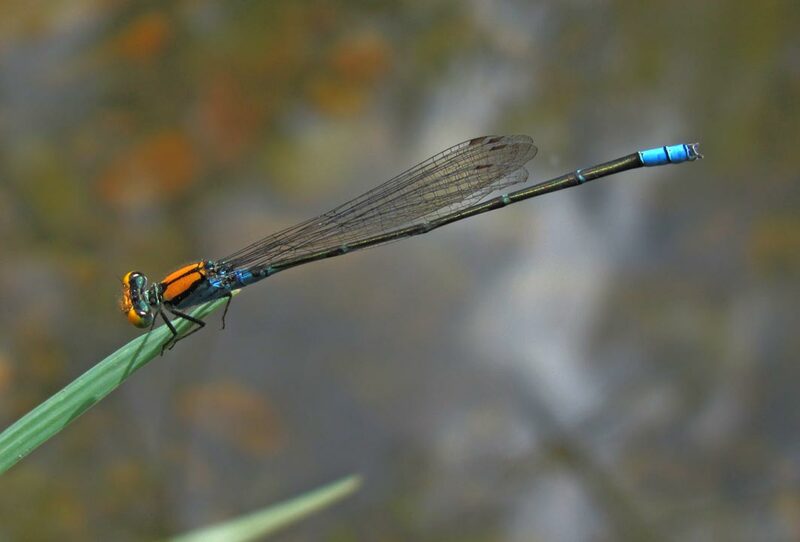 Common Bluetail Ischnura heterosticta, male. 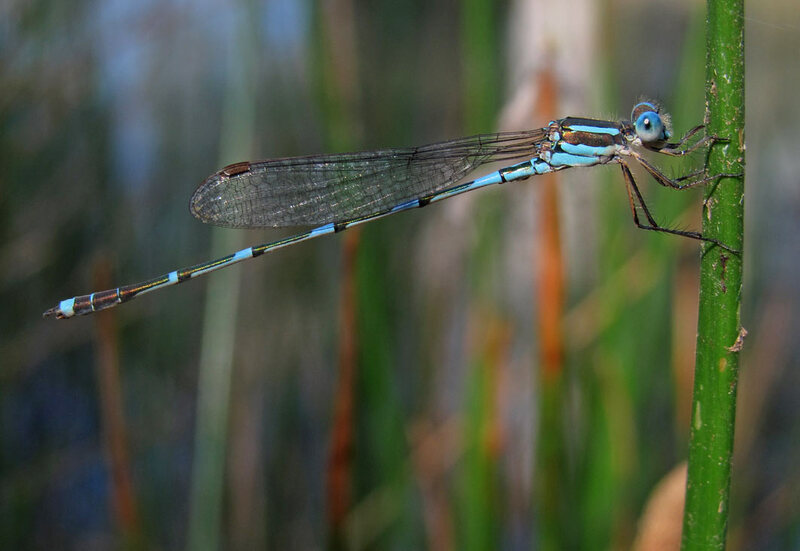 Occasionally seen on dams, Crown Creek, Capertee River and Dunn’s Swamp. Medium size. 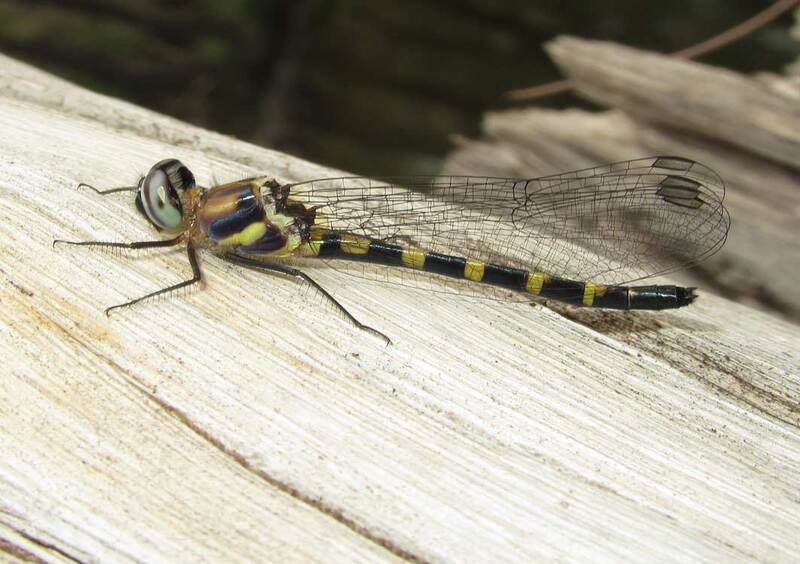 Common Bluetail Ischnura heterosticta, female. (photographed at Lake Wallace, Wallerawang, NSW). 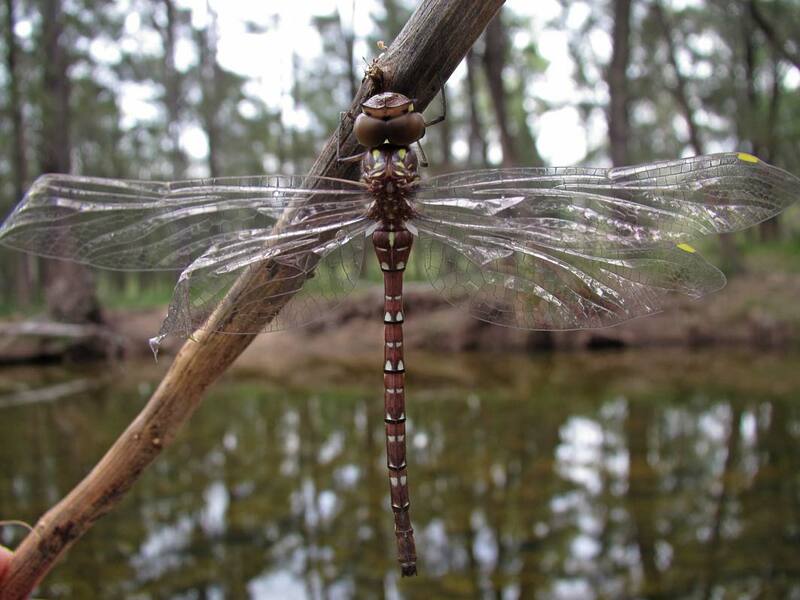 Unicorn Darner Austroaeschna unicornis, female. 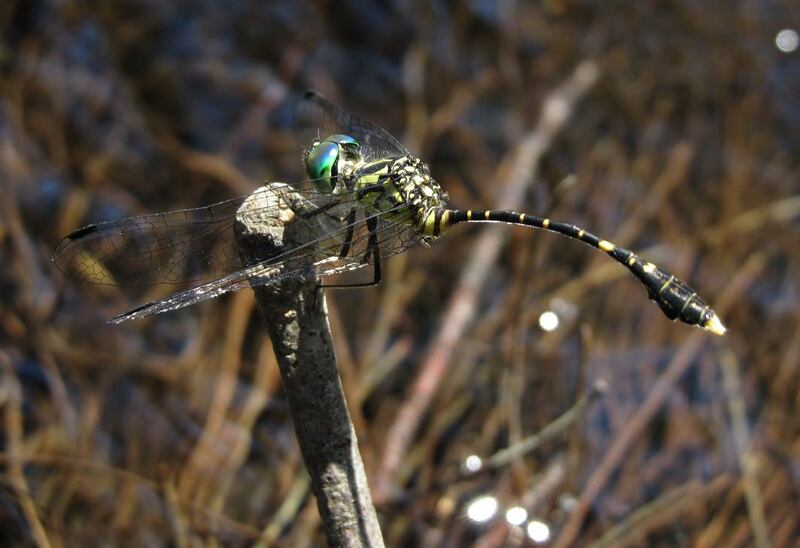 Occasionally seen on Coco Creek, this very large dragonfly flies constantly back and forth over long pools and is thus difficult to identify. 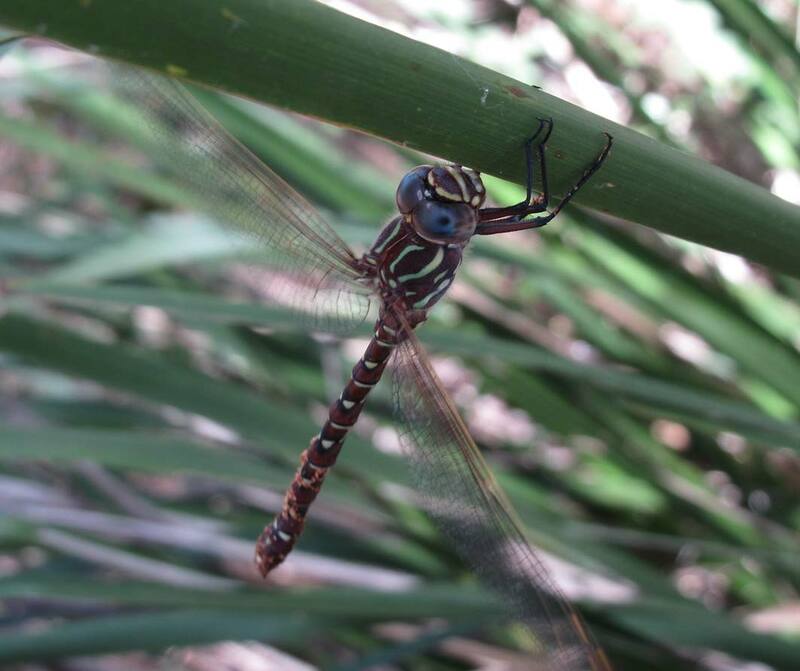 The blue eyes, patterned body and diagonal stripes on the thorax are distinctive for darner species. 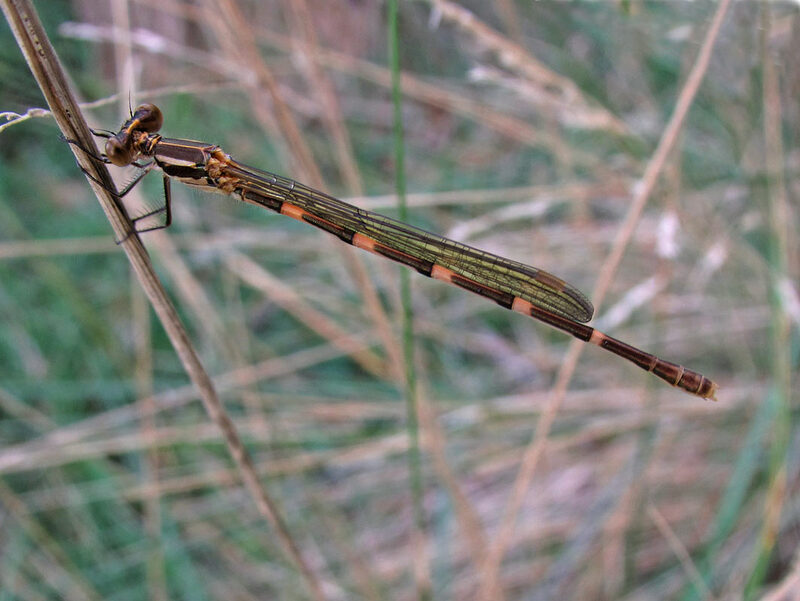 This female was hanging vertically from a lomandra frond, creekside. 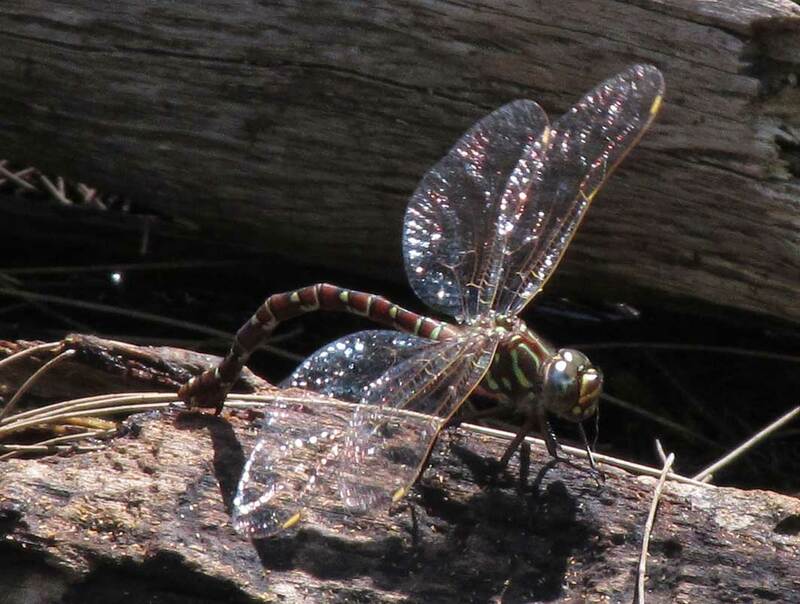 Unicorn Darner Austroaeschna unicornis, female. 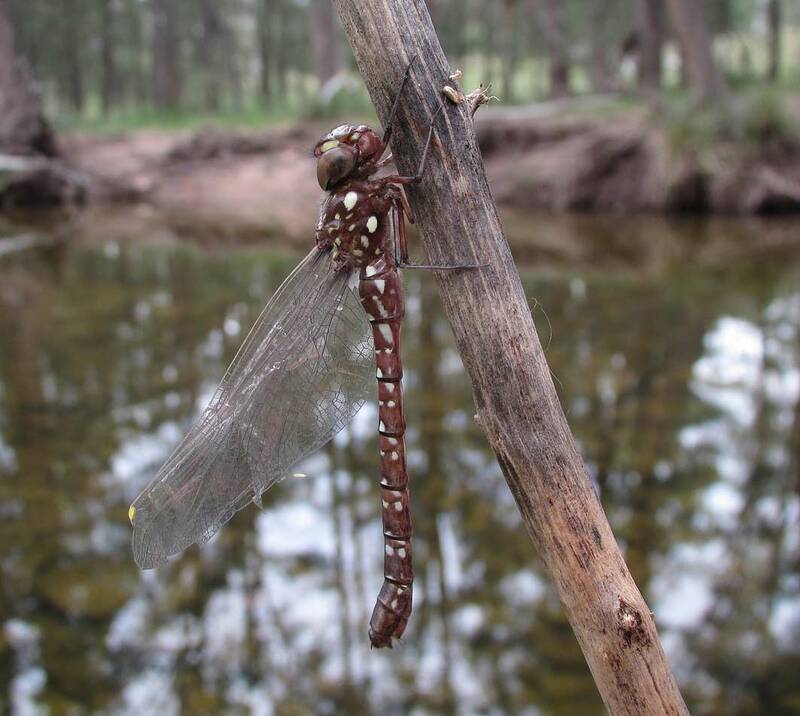 Unicorn Darner Austroaeschna unicornis, female laying eggs on a half-submerged rotten log. 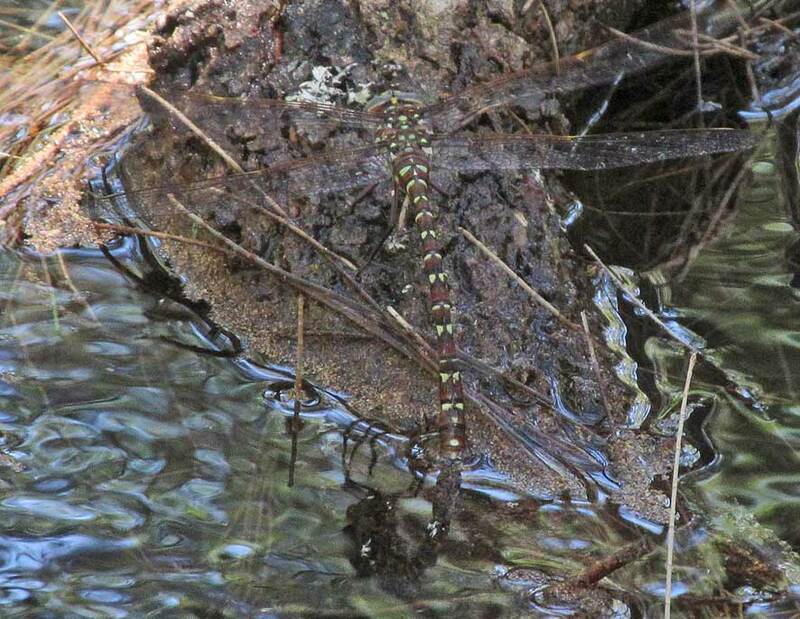 Unicorn Darner Austroaeschna unicornis, female laying eggs in water. 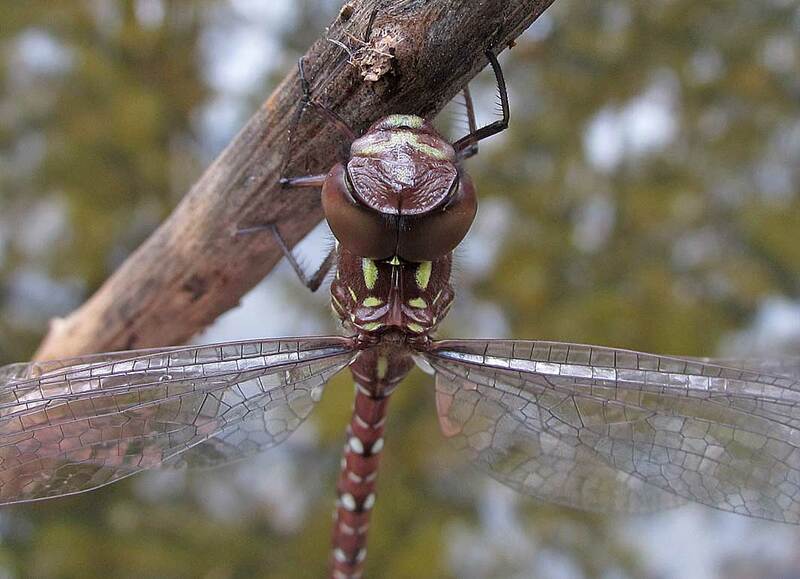 Wide-faced Darner Dendroaeschna conspersa, female, side view. Uncommon, I found this one at the Capertee River after it had become stranded in the water. I took these photos as it was drying out its wings. Large size. 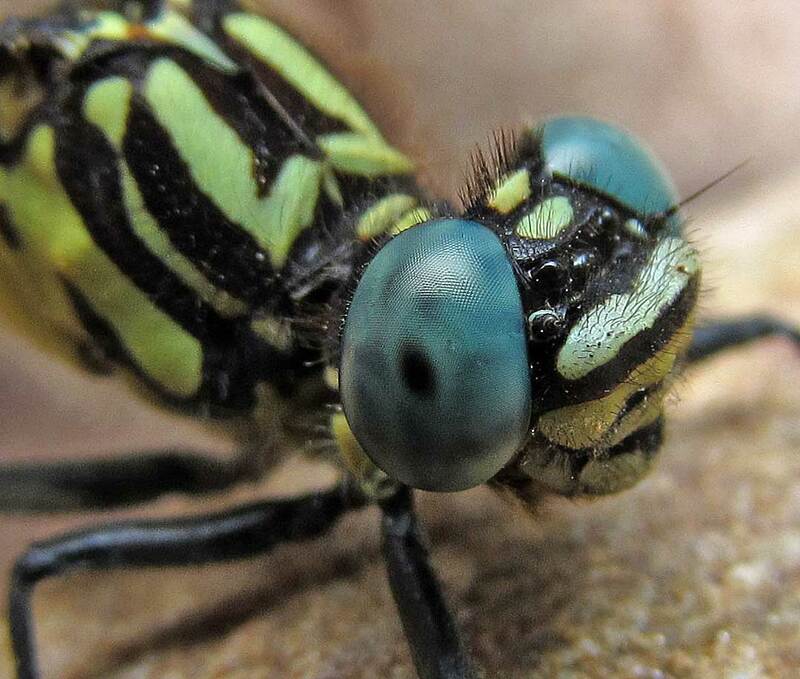 Wide-faced Darner Dendroaeschna conspersa, female, top view. 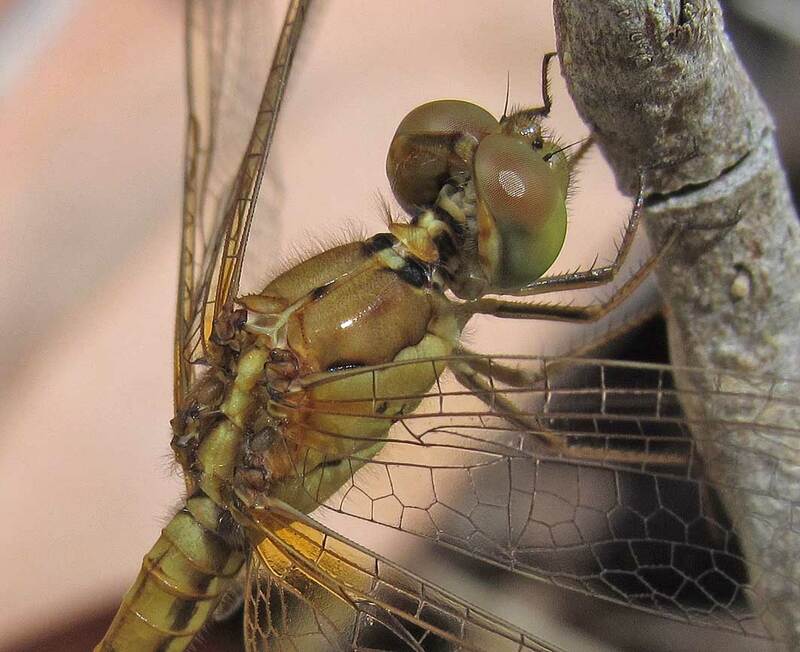 Wide-faced Darner Dendroaeschna conspersa, female, head (showing the wide face). 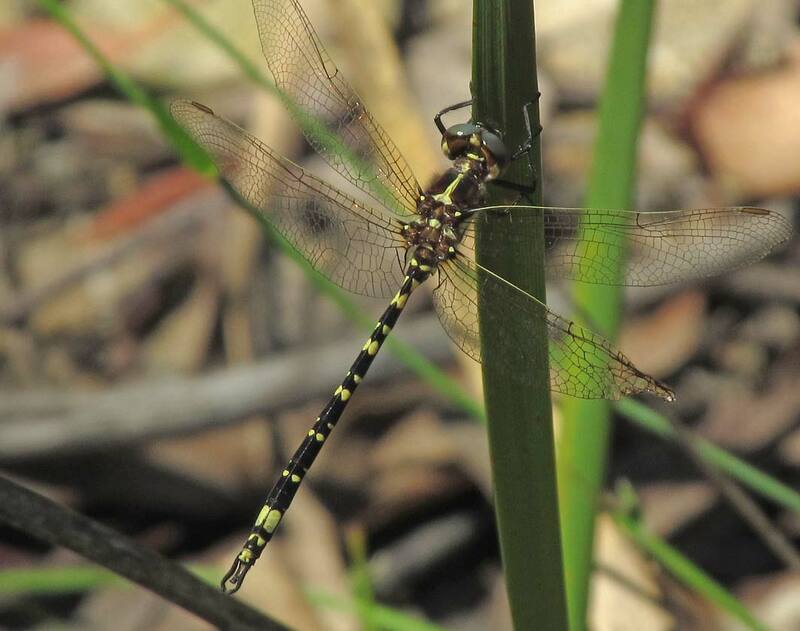 Australian Emperor Hemianax papuensis, adult in flight. 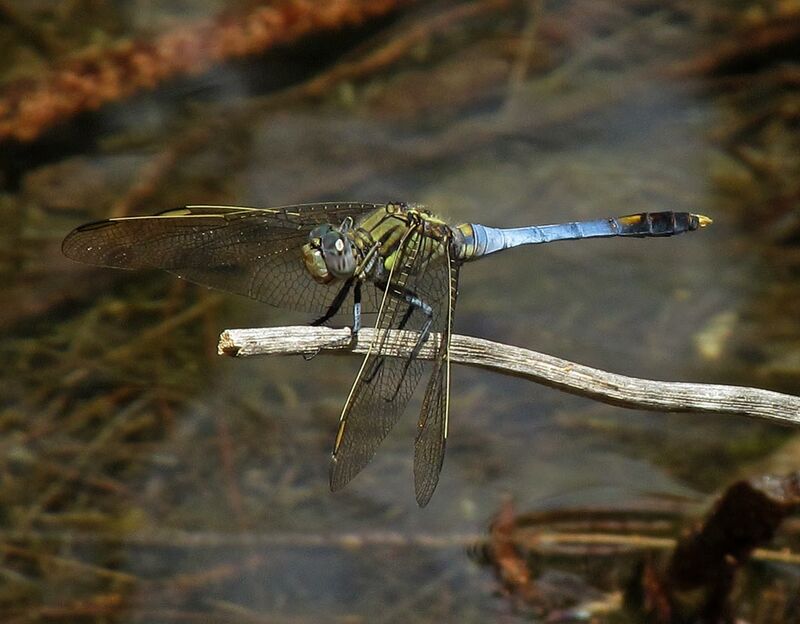 This large dragonfly rarely lands and spends the day zooming back and forth over long pools of water. It is fairly common and can be found in a variety of habitats in Capertee Valley, sometimes well away from water. 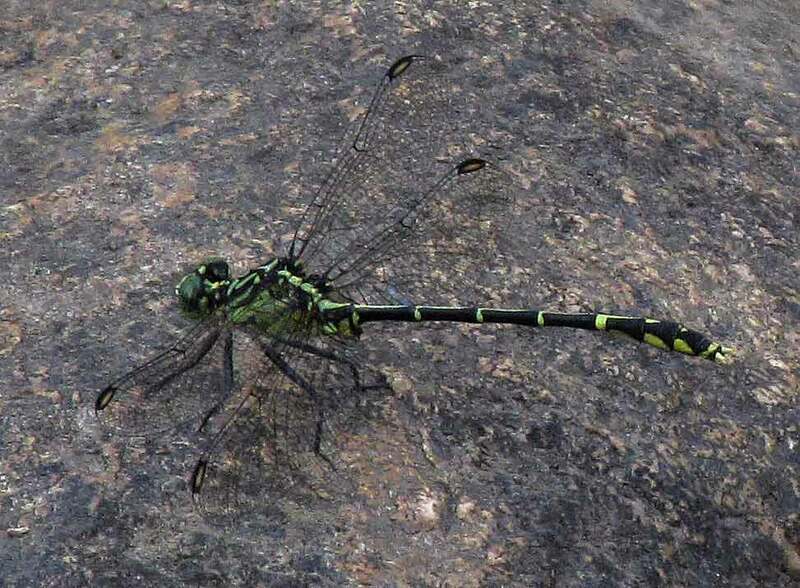 Note the diagnostic ‘yellow tail-light’ at the end of its tail, patterned body and pale green eyes. 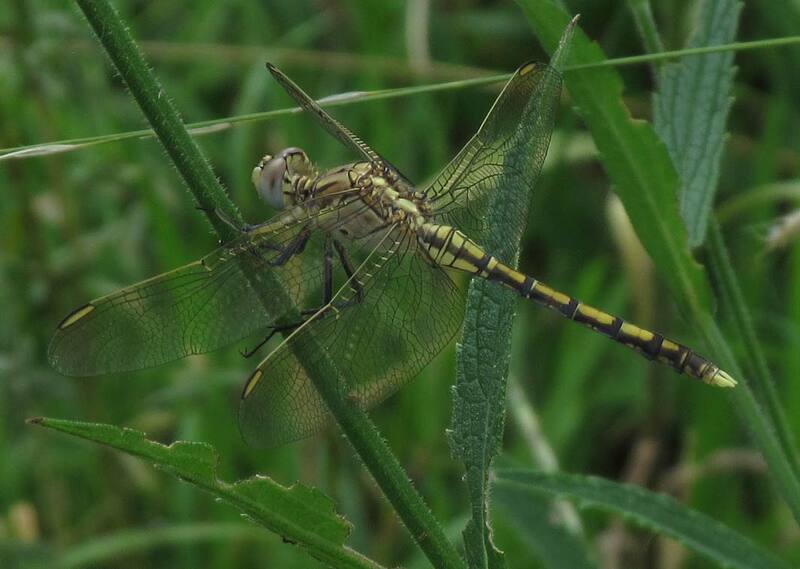 Yellow-striped Hunter Austrogomphus guerini, male. Note the prominent yellow stripe on the abdomen. Uncommon, with a single sighting of one perched on rocks along Coco Creek. Medium size. 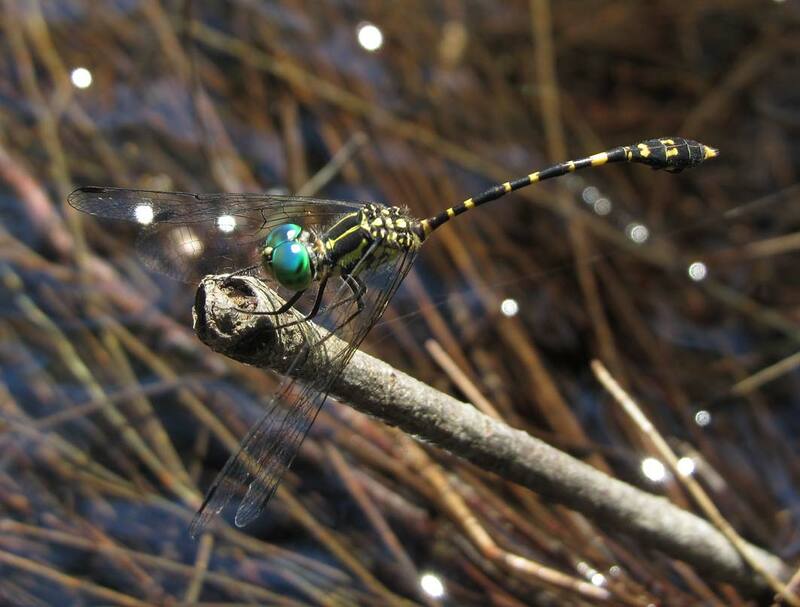 Jade Hunter Austrogomphus ochraceus, male, side view. 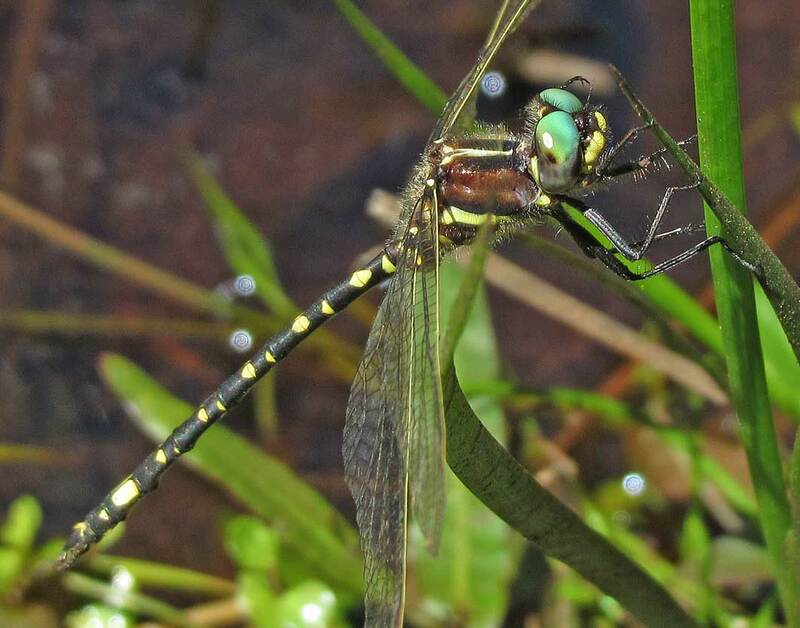 Note the stripe along the abdomen and the emerald green eyes. 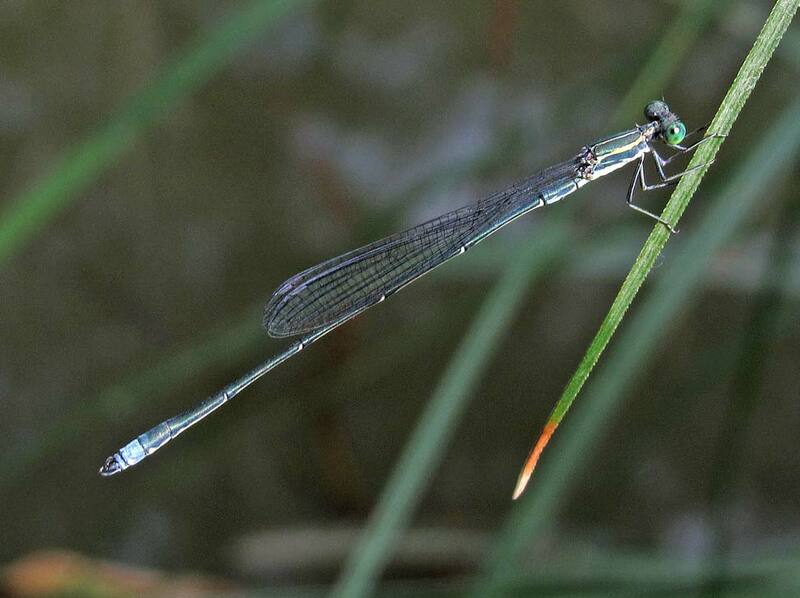 The male’s body is more slender than the female but has a club-like tip at the end. Uncommon, seen at the Capertee River, Coco Creek and Dunn’s Swamp. Medium size. 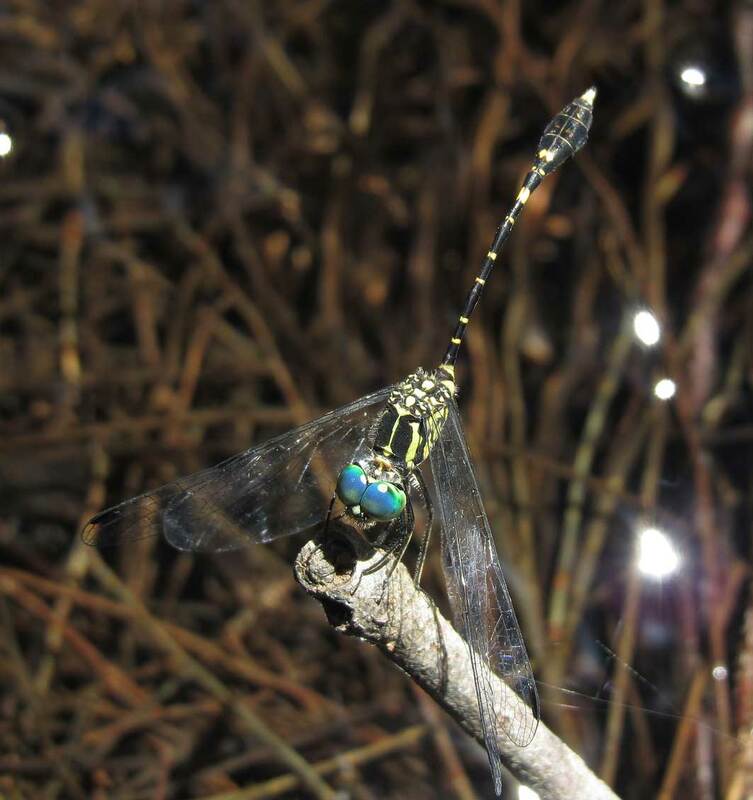 Jade Hunter Austrogomphus ochraceus, male, top view. 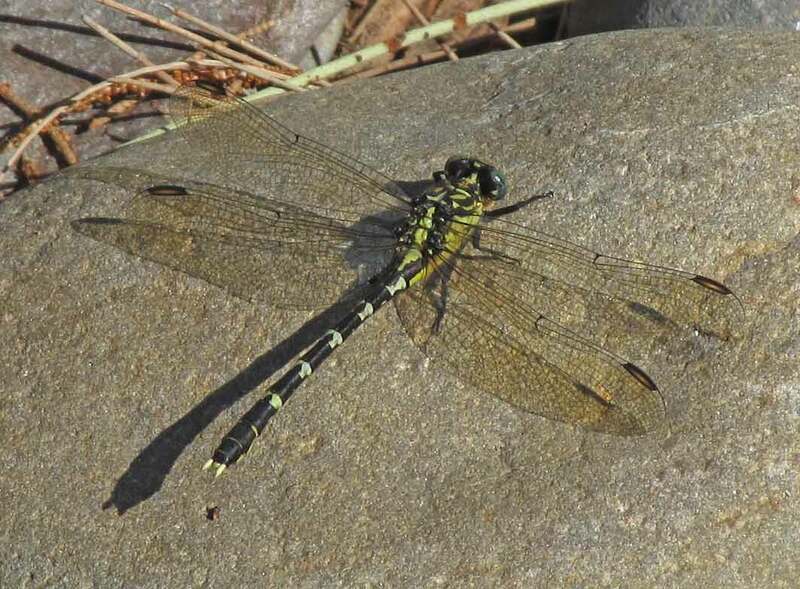 Jade Hunter Austrogomphus ochraceus, female, side view. Stout Vicetail Hemigomphus heteroclytus, male. 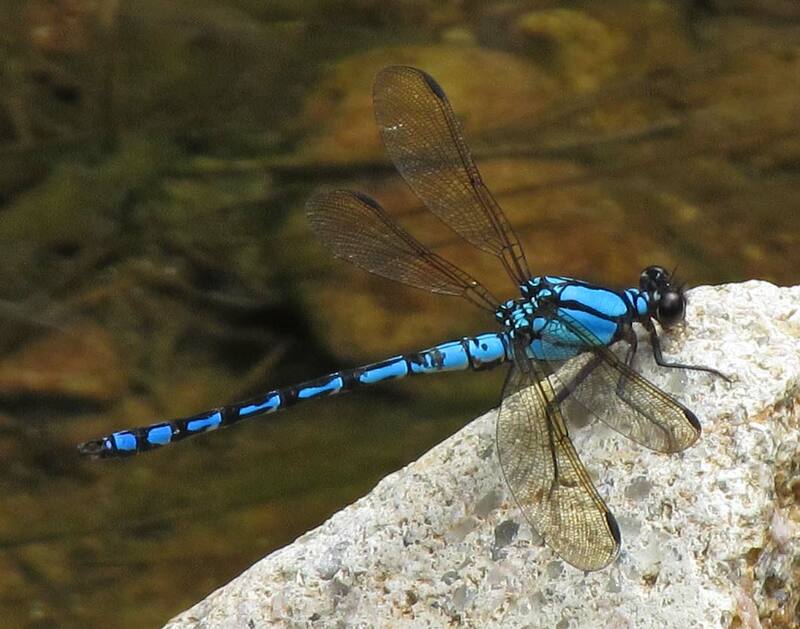 A commonly seen species along Coco Creek and the Capertee River, especially on rocks near fast flowing water. 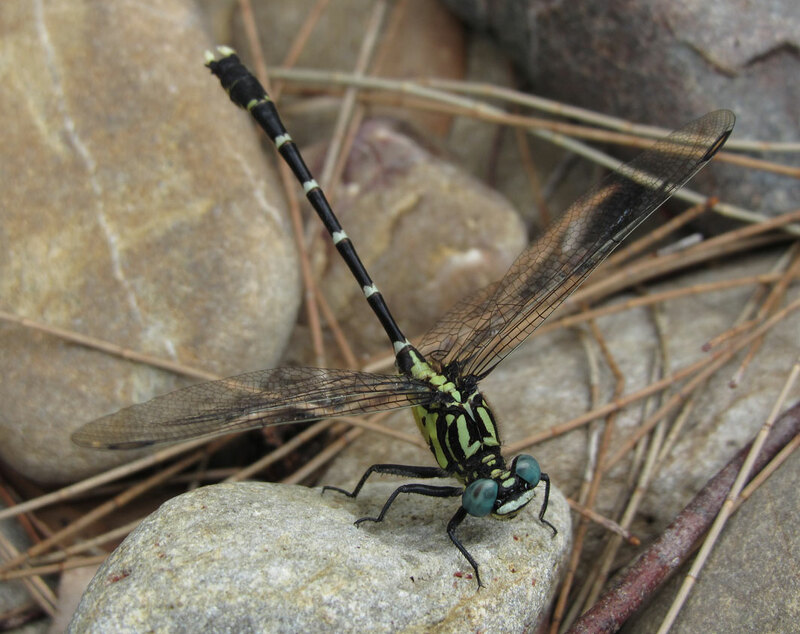 Distinctive turquoise eyes and diagnostic wide-set pincers on the end of the tail. Note lack of yellow stripe along the abdomen. Medium size. Stout Vicetail Hemigomphus heteroclytus, male. Another view of those massive pincers. 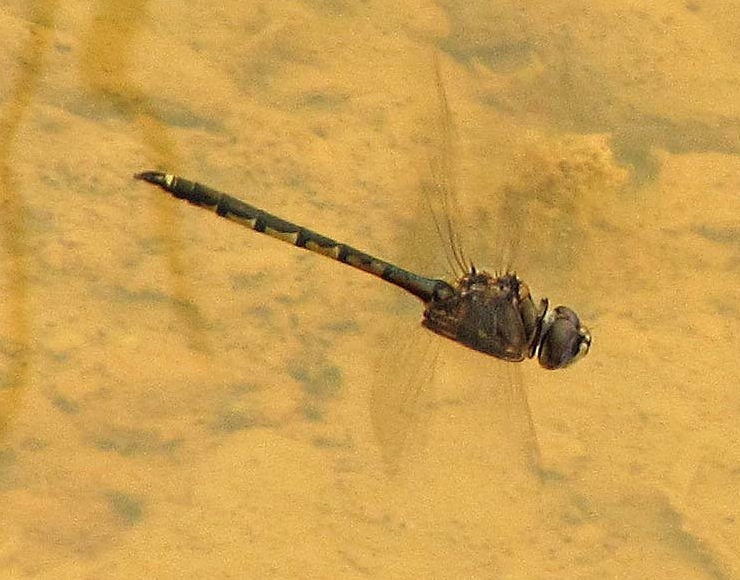 Stout Vicetail Hemigomphus heteroclytus, female (top view). Descriptions of the female seem poorly documented on the web. 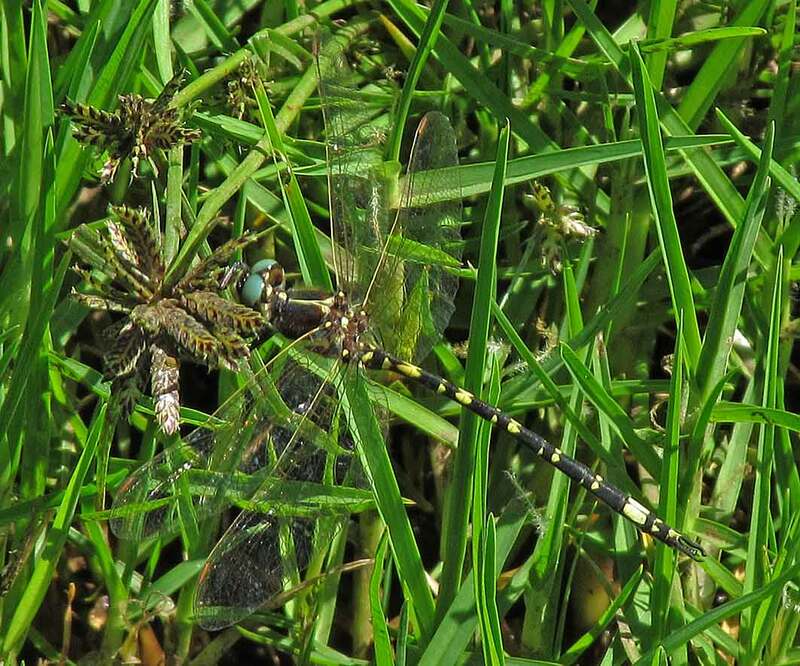 Note the broader patterning on the abdomen compared to male but the same turquoise eyes. Stout Vicetail Hemigomphus heteroclytus, female (side view). Stout Vicetail Hemigomphus heteroclytus, male, close-up of head and eye. Swamp Tigertail Synthemis eustalacta, male. Uncommon, this one was in long grass near a farm dam at Mt. Airly (sandstone woodland, Mugii Murum-ban State Conservation Area.) Large size. Swamp Tigertail Synthemis eustalacta, male. 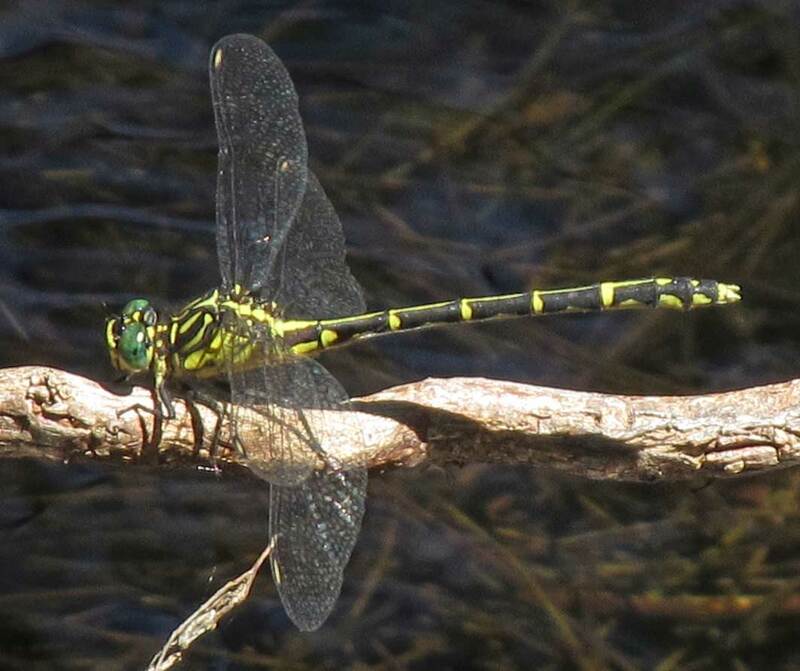 From Dunn’s Swamp, with a damaged wing. Swamp Tigertail Synthemis eustalacta, male, head close-up. From Dunn’s Swamp. Common Shutwing Cordulephya pygmaea, male, top view. Uncommon but more seen in autumn, several found along Crown Creek, Coco Creek, Capertee River, Mt. Airly & Dunn’s Swamp. Sometimes away from water perching on logs. Medium size. Common Shutwing Cordulephya pygmaea, male, side view. Common Shutwing Cordulephya pygmaea, female, side view. Australian Emerald Hemicordulia australiae, male in flight. 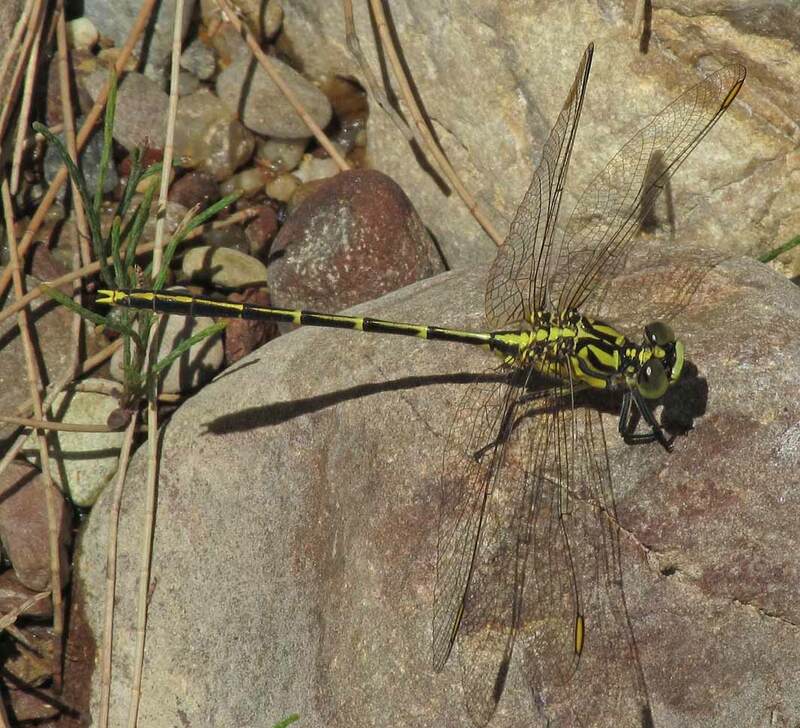 A medium-large species that is commonly seen zooming back and forth over long pools at rivers, creeks and dams. 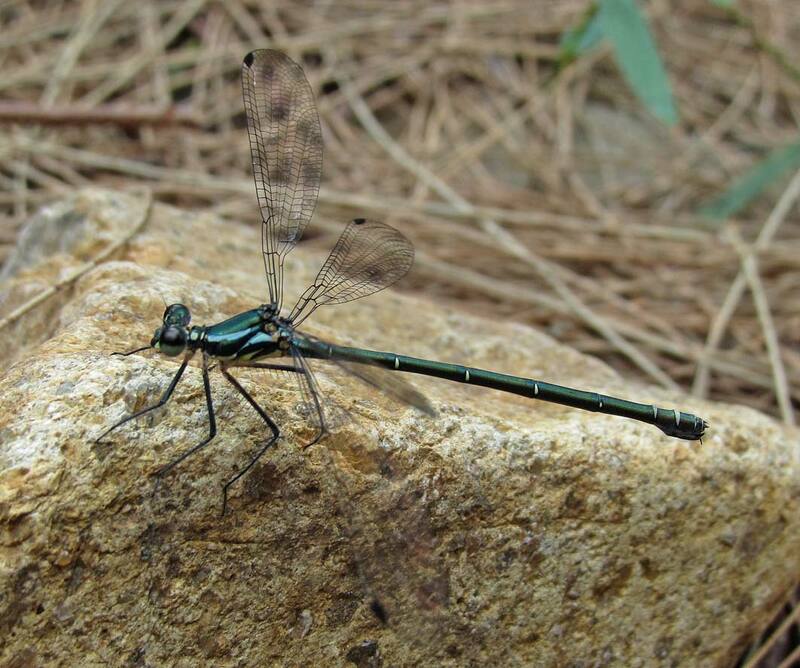 In flight, note the dark tail tip to distinguish it from the larger Australian Emperor, and note the greenish-black metallic face to distinguish it from Tau Emerald. 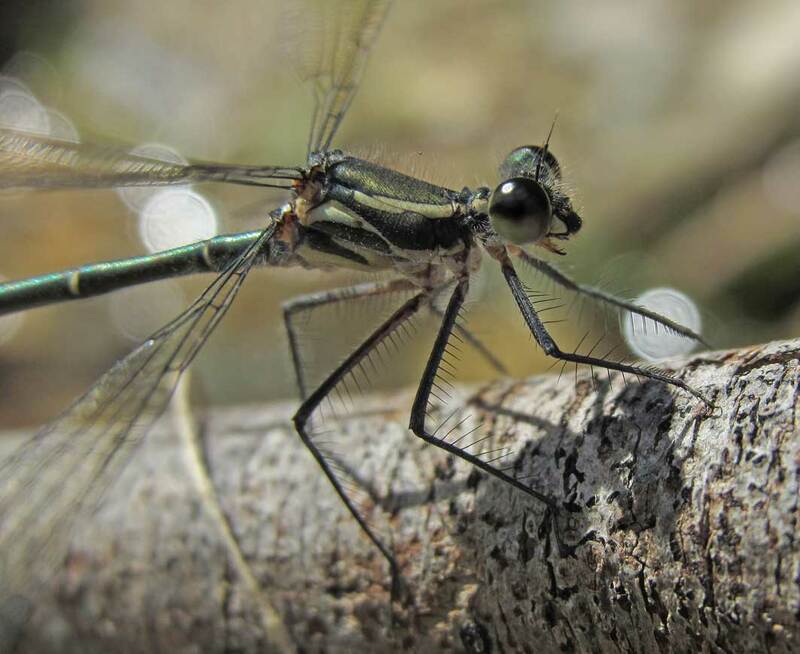 The emerald-coloured eyes are also distinctive. Australian Emerald Hemicordulia australiae, male perched. This one was photographed at Lake Wallace, Wallerawang, on a rainy day. 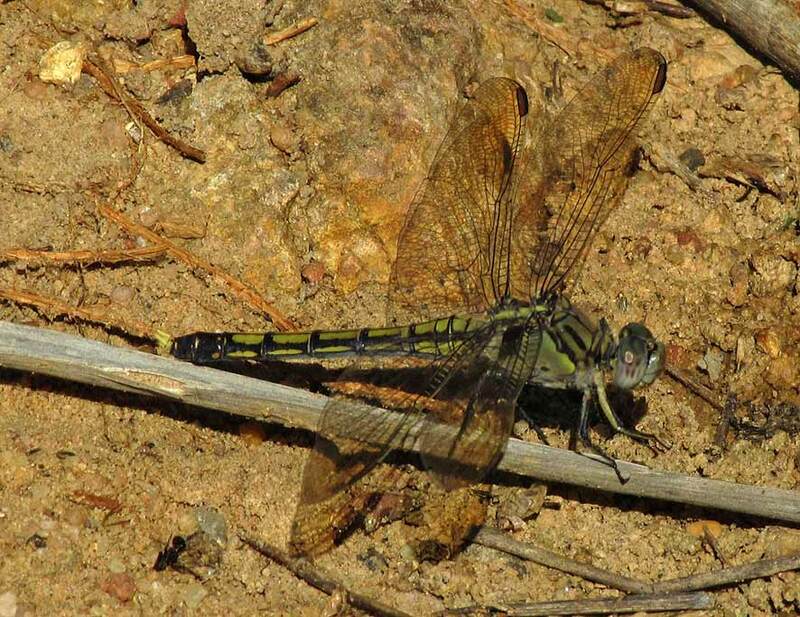 Note the tattered wings of this older male. 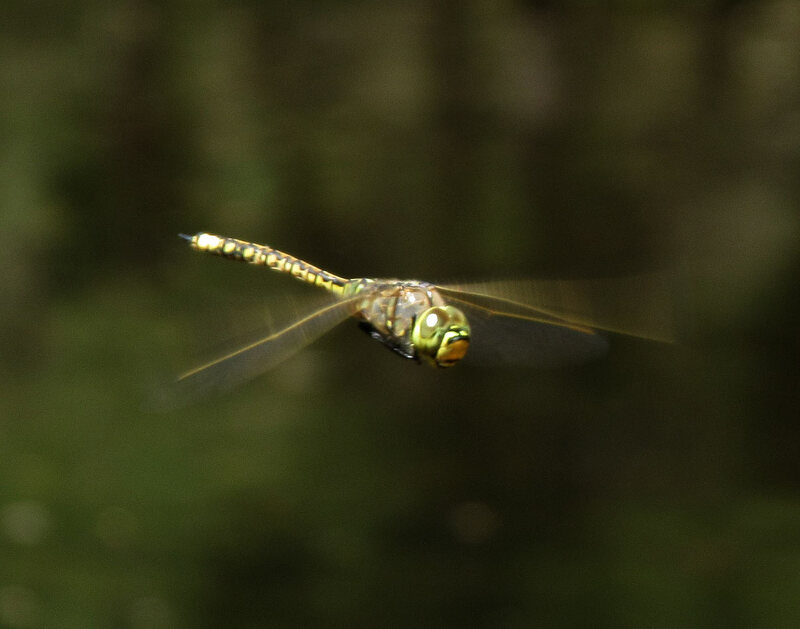 Tau Emerald Hemicordulia tau, male in flight. 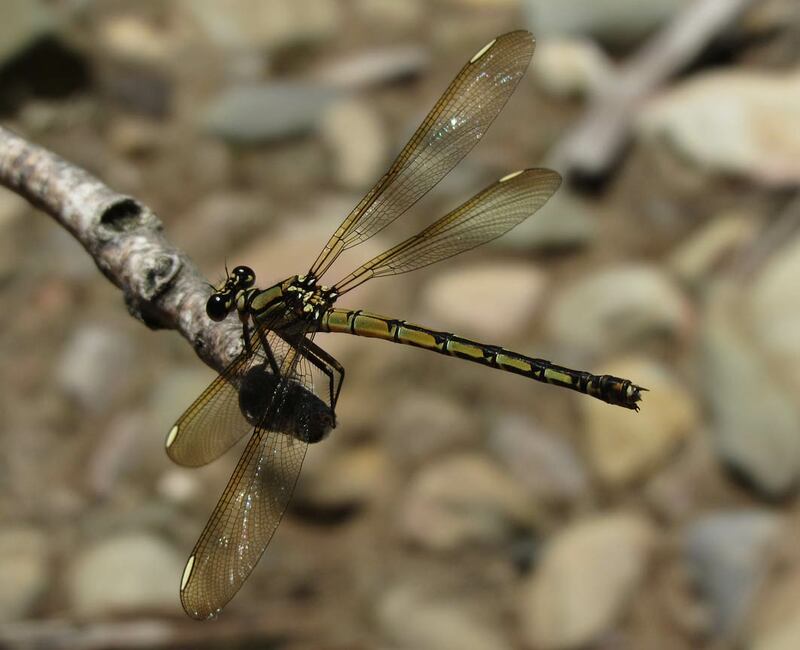 Uncommon medium-large dragonfly, similar to Australian Emerald but has brown eyes and a T-mark on the face. 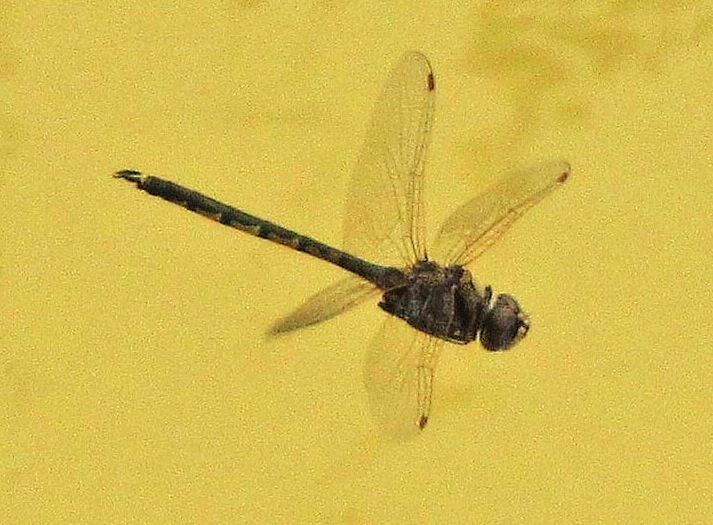 Tau Emerald Hemicordulia tau, male in flight. Showing more wing detail and “undulating superior appendages”. Common Archtail Nannophlebia risi, male. Uncommon, a small group were perching on twigs over shallow running water on one section of Coco Creek. This is a small species with lovely green eyes that are in contact. The males have a clubbed tail. Medium size. Common Archtail Nannophlebia risi, male. 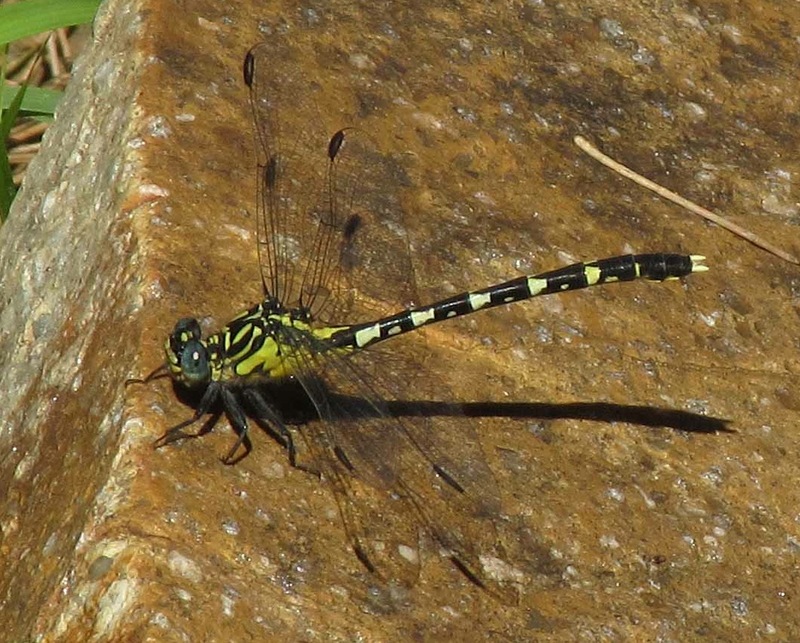 Note how this male has less pattern on the tail tip than the previous photo. 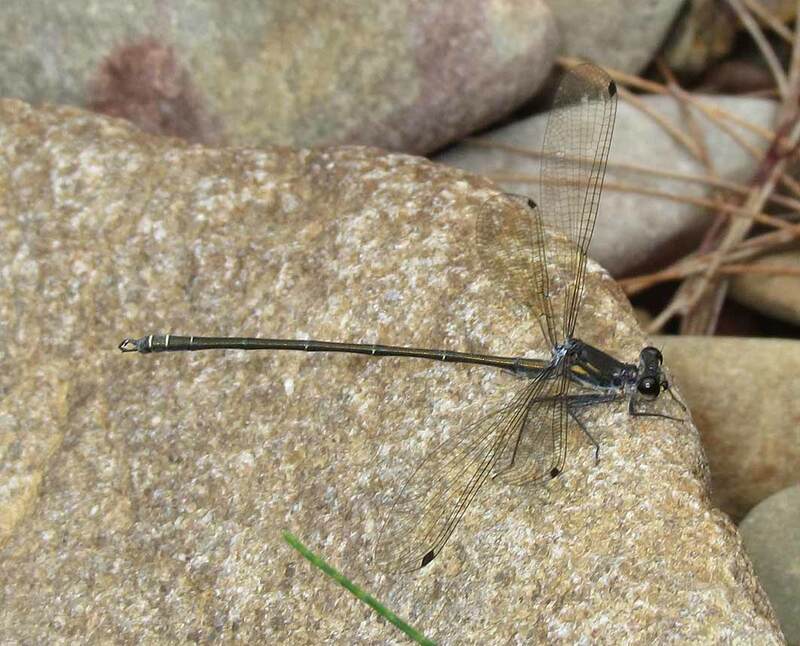 Common Archtail Nannophlebia risi, male, side view. Blue Skimmer Orthetrum caledonicum, male. 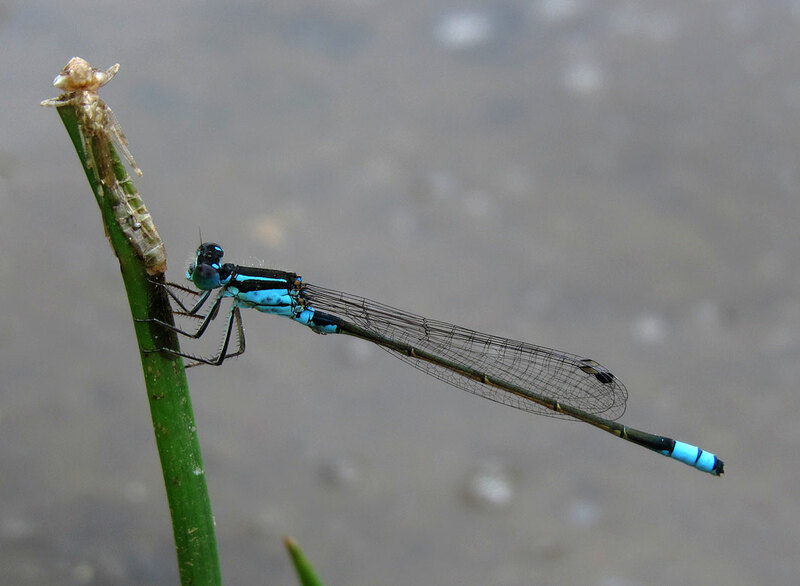 A commonly occurring species, found on dams and creeks, and also in vegetation well away from water. The mature male is a powdery-blue colour. Medium size. 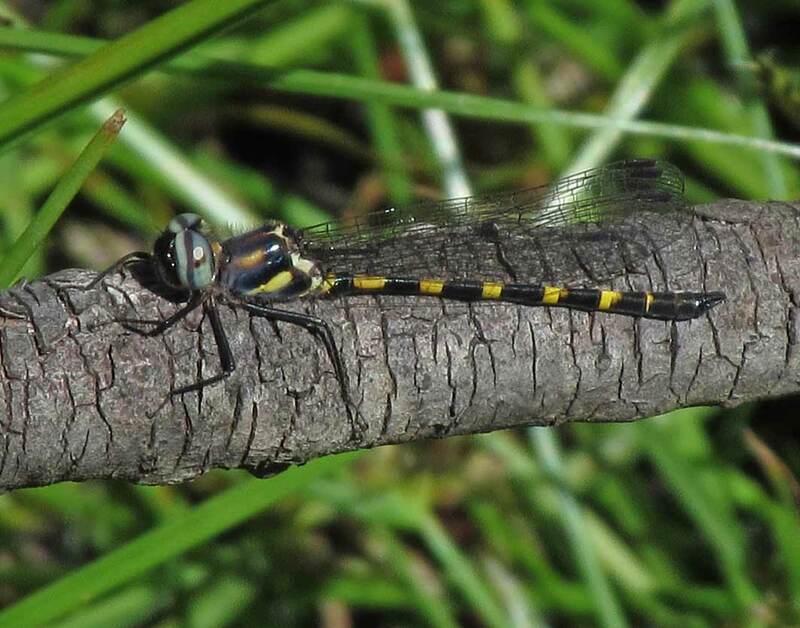 Blue Skimmer Orthetrum caledonicum, immature yellow male. The colouring is similar to a young female. Blue Skimmer Orthetrum caledonicum, possible female. Older females are blue and can be almost indistinguishable from males, while younger females are yellow. Older females always retain a yellow tip to their tail. 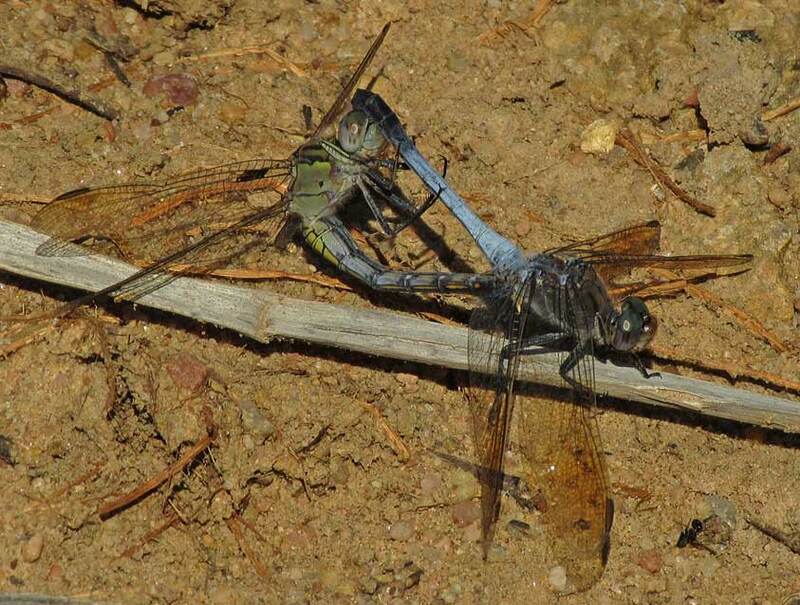 Blue Skimmer Orthetrum caledonicum, pair mating in the wheel position. Showing a younger female with yellow colouring and a mature blue male. Blue Skimmer Orthetrum caledonicum, yellow female. This is a younger female, the same one as pictured above, just after mating. 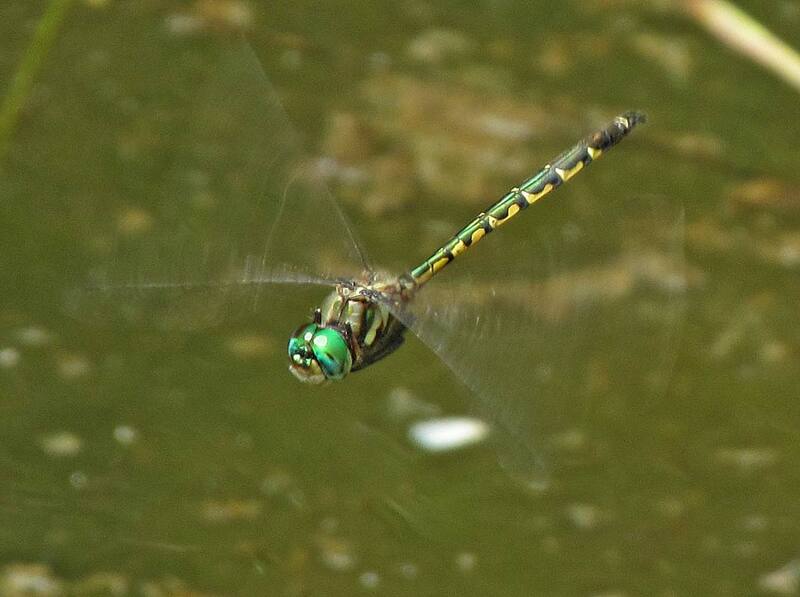 Moments later she flew off and laid her eggs on floating algae on a dam. Blue Skimmer Orthetrum caledonicum, blue female. 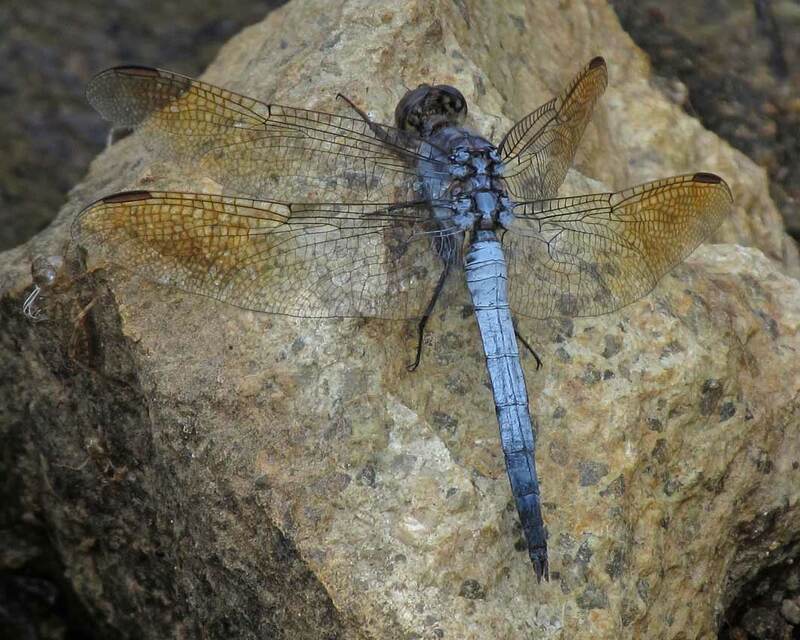 This is an old, powdery-blue female, her wings were tatty but her flight was still agile. She had just caught and eaten a small moth in bushland well away from water. Fiery Skimmer Orthetrum villosovittatum, male. 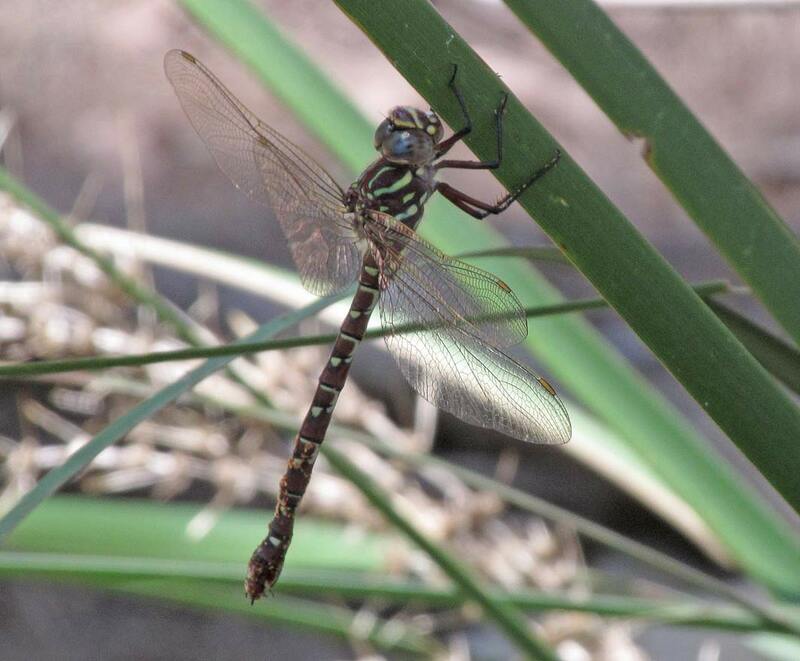 Uncommon, I only found one of this species, guarding a stagnant pool alongside Coco Creek. Medium size. 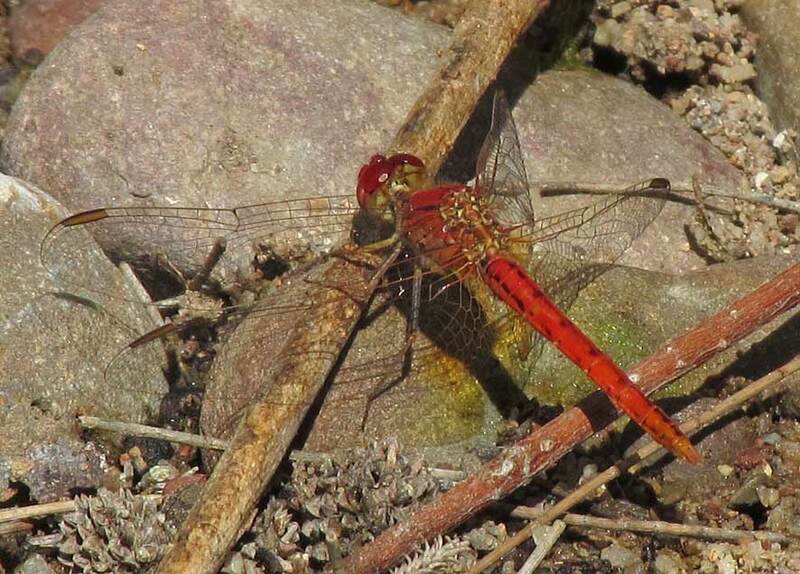 Scarlet Percher Diplacodes haematodes, mature male. Common along streams, rivers and dams. 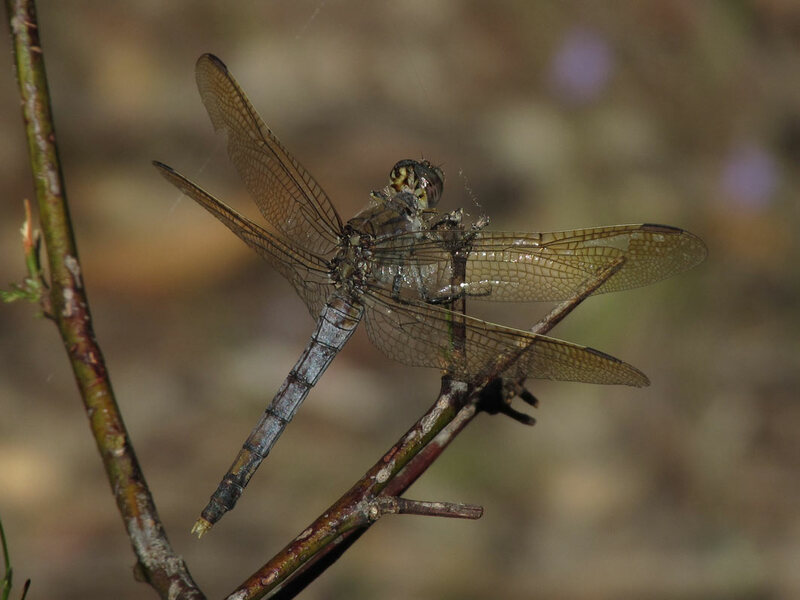 Note the slightly flattened body and lateral ridges compared to the Wandering Percher which has black speckles and a more cylindrical body. Medium size. 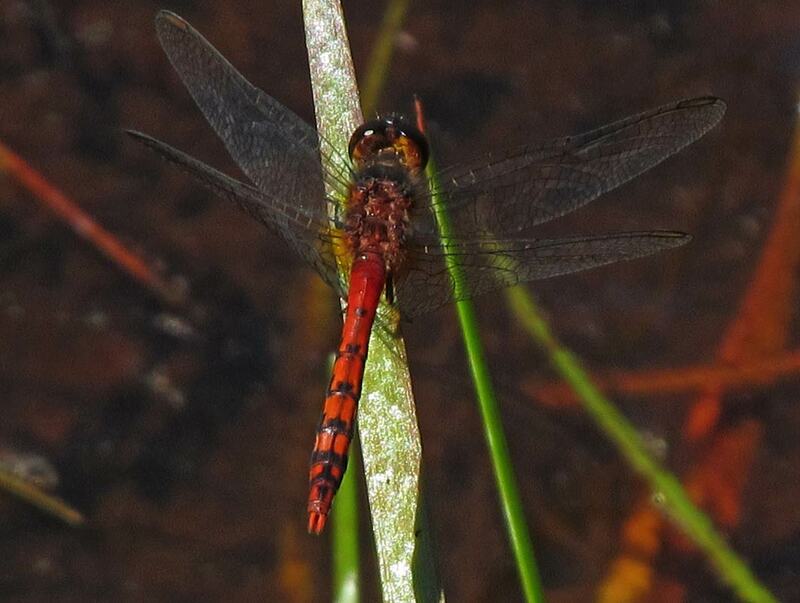 Scarlet Percher Diplacodes haematodes, younger male. This one still has some black speckling, but note the lateral ridges. 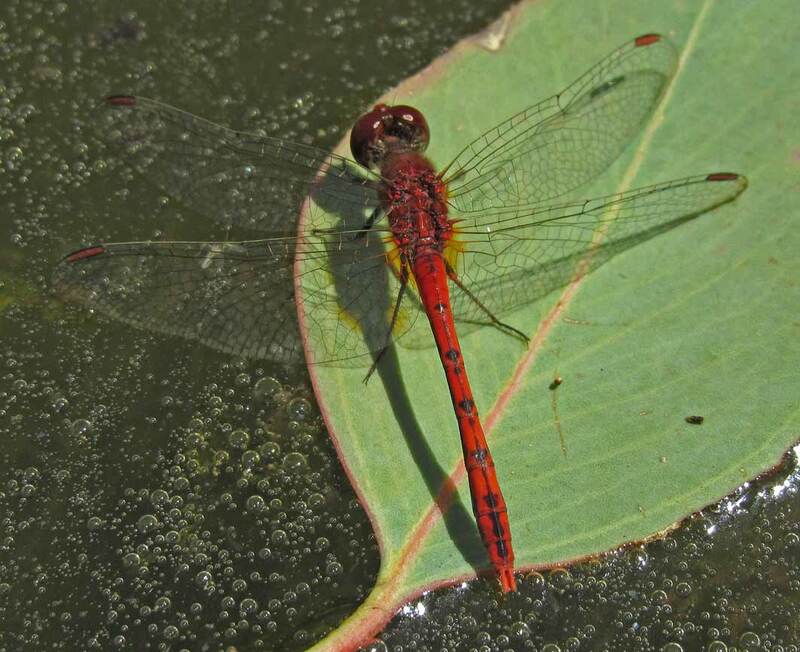 Scarlet Percher Diplacodes haematodes, immature male. Scarlet Percher Diplacodes haematodes, immature male, close-up. 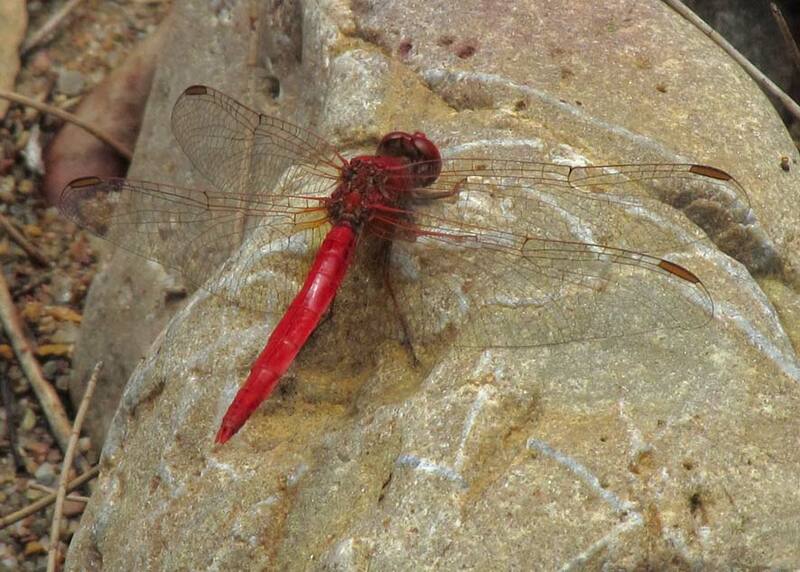 Scarlet Percher Diplacodes haematodes, female, side view. 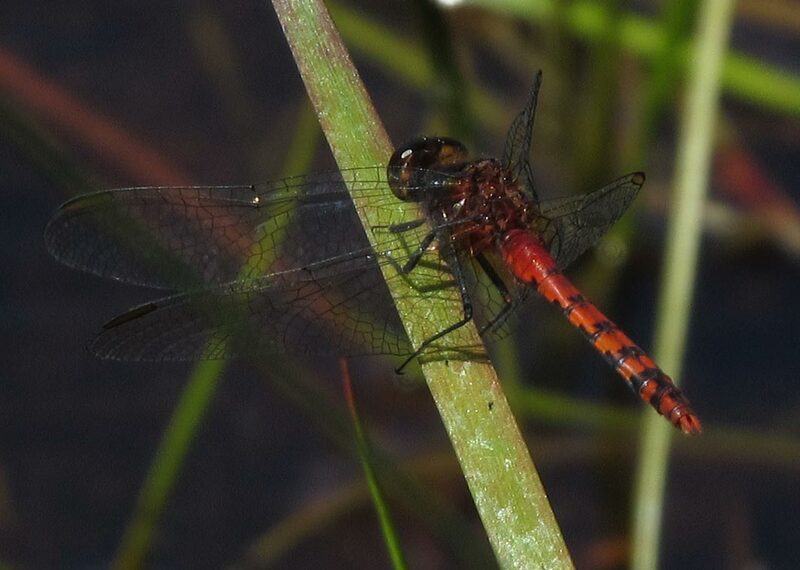 Wandering Percher Diplacodes bipunctata, mature male. 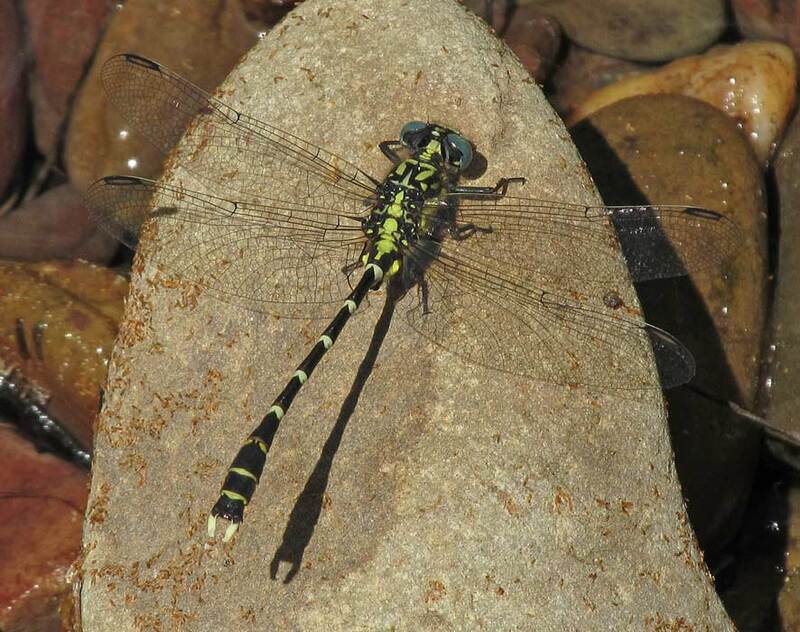 Common along most streams and dams, although rarely seen at Coco Creek. Medium size. 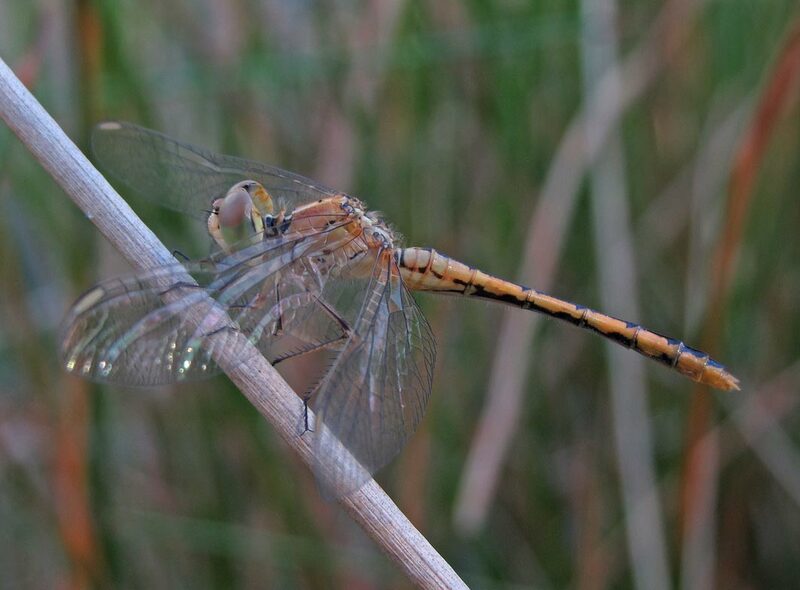 Wandering Percher Diplacodes bipunctata, mature male. Wandering Percher Diplacodes bipunctata, female. 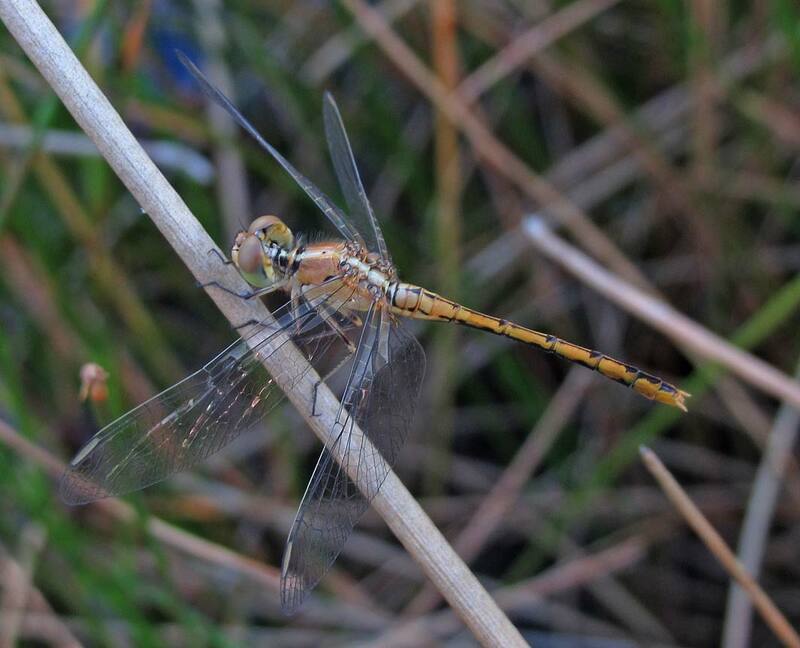 Wandering Percher Diplacodes bipunctata, female, side view. 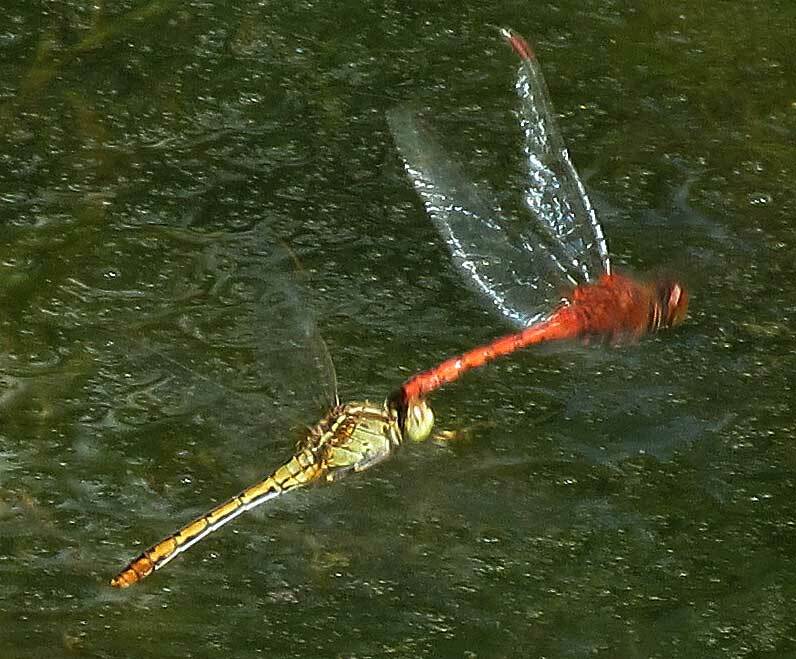 Wandering Percher Diplacodes bipunctata, male and female flying in tandem, female is laying eggs in water. 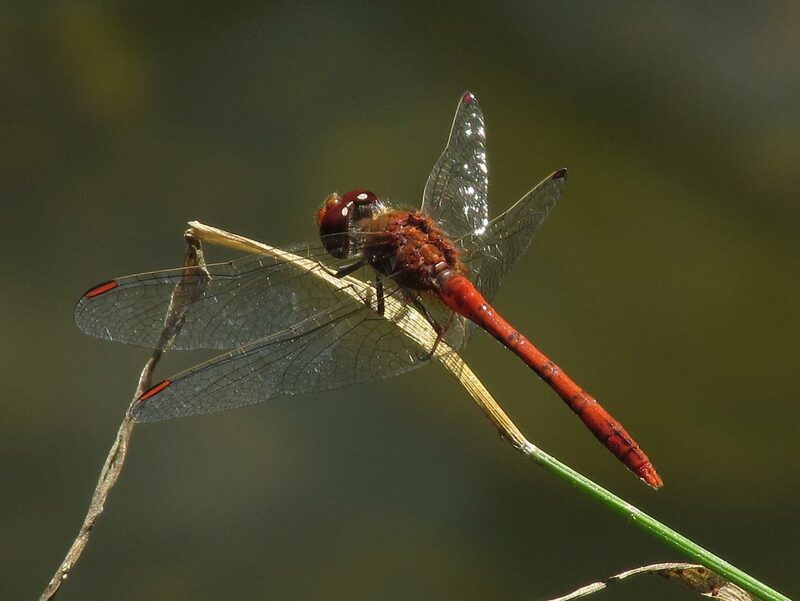 Black-faced Percher Diplacodes melanopsis, male, top view. 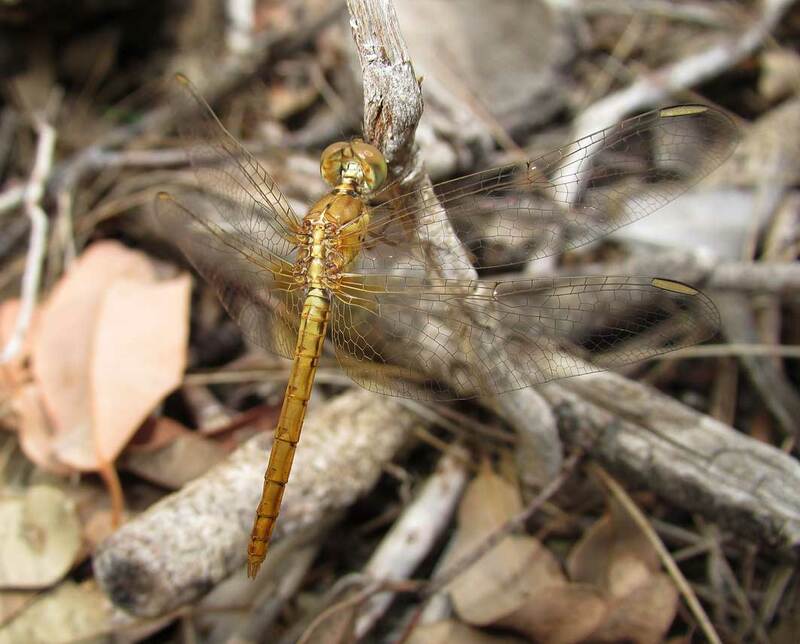 I found this one at Dunn’s Swamp which is on the fringes of Capertee Valley. Medium size. 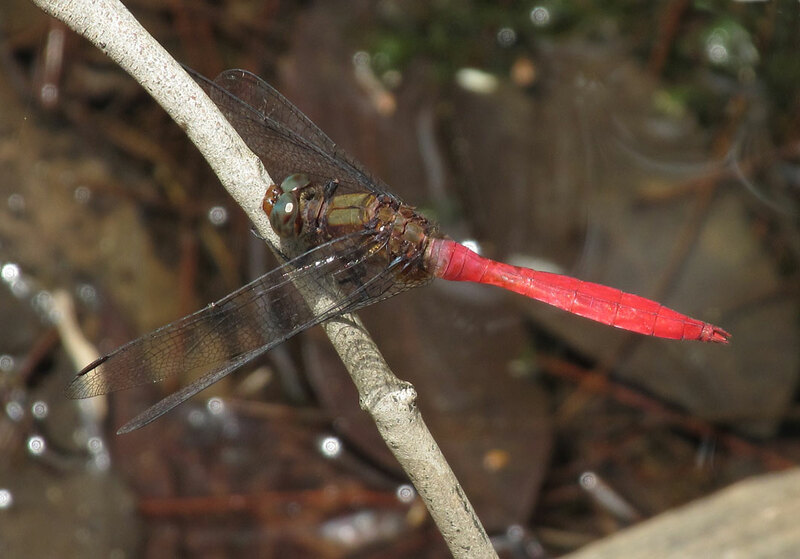 Black-faced Percher Diplacodes melanopsis, male, side view. This page was created in 2013 and upgraded 3 June 2017.